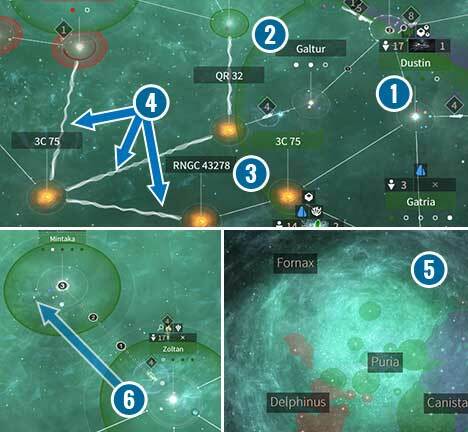 The following game guide to Endless Space 2 contains all of the information required to conquer the galaxy. The game is a classic representative of the 4X type strategy, meaning: exploration, expansion, exploitation and extermination. Here you will find tips concerning the first steps in expanding your civilization and acquiring resources. You will certainly find the information about planets and systems, the way you travel and build your fleet, extremely useful. One large novelty in the series, and an innovation in comparison to other similar civilization building strategies, is the ideology of your population and its influence on your way of governance. Additionally, you will also find descriptions of other useful areas of the game such as diplomacy, conquest, trading companies or heroes. 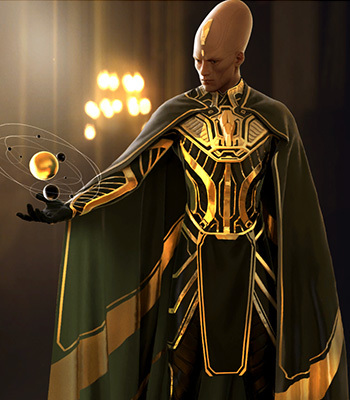 Endless Space 2 is a continuation of a rather complex game about creating and expanding a galactic civilization. You have influence on many Aspects here: acquiring new territories, dealing with other races, designing and building space fleets, influencing the ideologies of your subjects and introducing new laws. 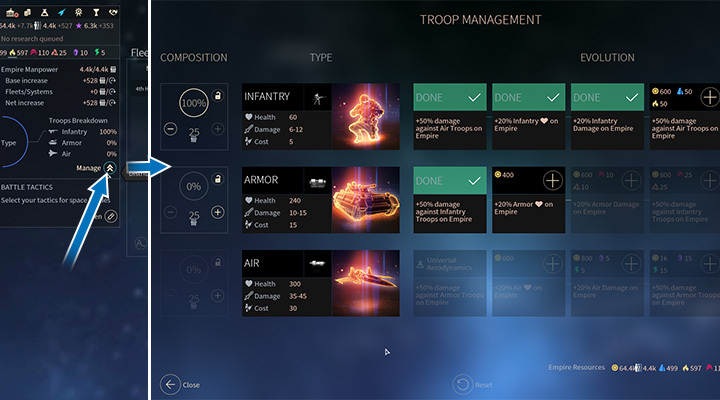 The game is focused on the narrative by means of the additional quests and several victory conditions. This guide was created based on the English Full Version of the game. General tips and interface description. Information about the division of resources (FIDSI, strategic, etc..). How to expand your territory and gain new systems/races/minor factions. How do ideologies, government types and laws work? Ship design, creating fleets and leading wars. Description of hero types; which heroes and development paths to choose. 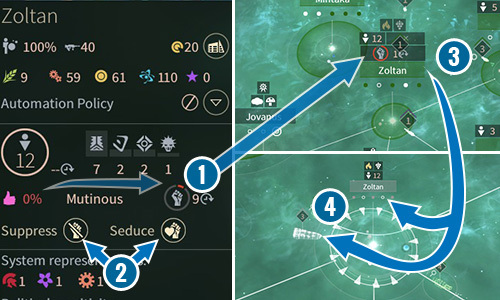 10 tips for a good beginning in Endless Space 2 Endless Space 2 Guide. How to start in Endless Space 2? Learn how to play with our guide. General Tips Endless Space 2 Endless Space 2 Guide. How to start in Endless Space 2? Here you can find information on the beginning of the game. Planets and anomalies in Endless Space 2 Endless Space 2 Guide. Trading Companies and Marketplace in Endless Space 2 Endless Space 2 Guide. Roles and types of ships in Endless Space 2 Endless Space 2 Guide. Endless Space 2 is a 4X type space strategy. The game was developed by a team of Amplitude Studios – the same people who produced the first part of the series. Virtual universe is generated randomly, thus every new game features new adventures and challenges. 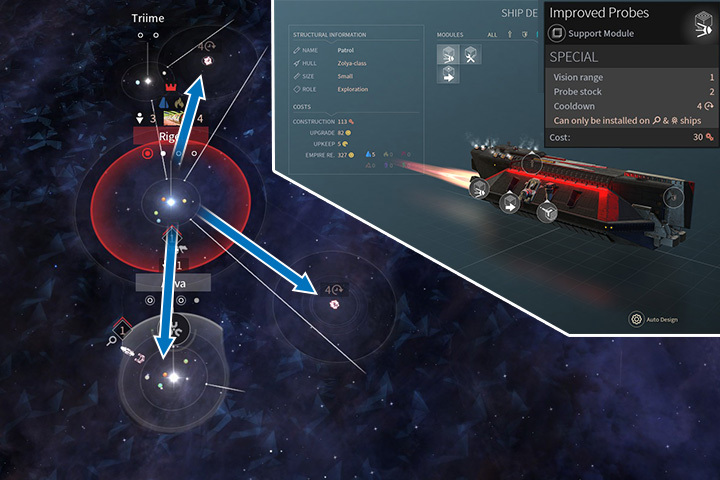 Both the combat, and development side of the game are based on a turn system. 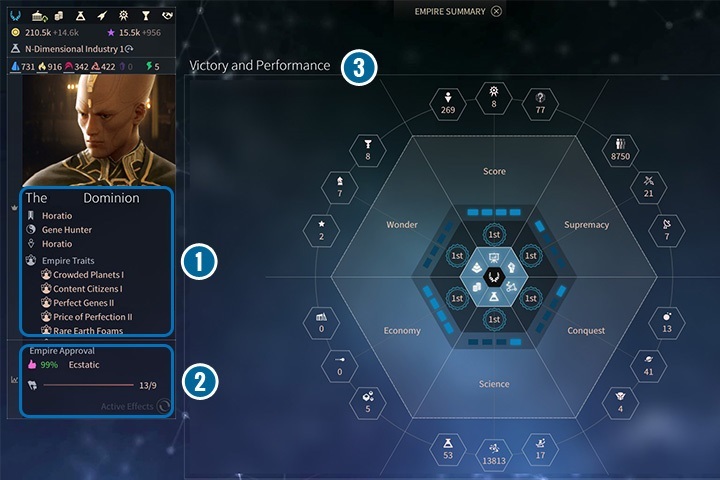 During the game, the player has to explore the universe, seize the control over planets, organize a healthy economy, establish trade and diplomatic relations, and develop new technologies. The military is also a key factor; it is necessary to build large fleets of ships, and then to command them during stellar skirmishes. 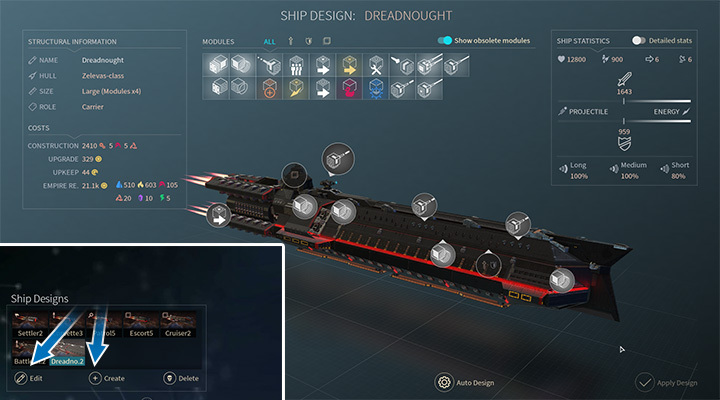 One of the main features of the game is an advanced ship construction system, allowing us to choose weapons, engine, armor, and on-board systems for each machine. 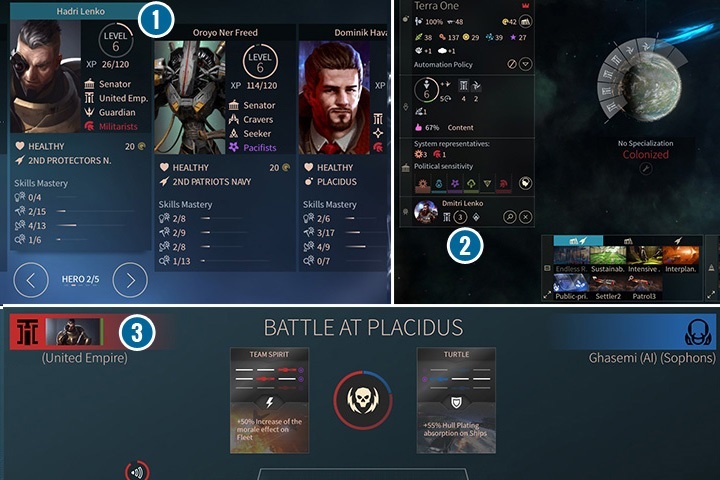 Endless Space 2 offers a single player mode, in which we’re challenged by artificial intelligence, as well as the multiplayer, where players can decide whether they want to introduce factions controlled by the AI or not. 1. During the first playthrough, choose the Imperials (i.e. humans – the United Nations), Sophon or a bit more challenging Horatio. All of the above colonize the same way. They need a colony ship, an empty system with habitable planets. Humans are dependant on the influence, which allows them to facilitate building or developing technologies. The Sophon are great scientists and provide additional bonuses if they’re the first to discover something and know the surrounding systems. 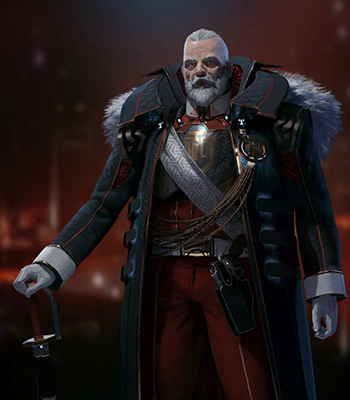 Horatio have the “gene hunter” faction affinity – they can import the genes of other races and merge them with their own. They also have a default bonus to happiness per capita and begin with the ecologist part ruling (they’re able to colonize almost every planet with only a minor penalty to production). 2. Exploration – looking for habitable planets and investigating anomalies should be your priority during the initial turns. Look for habitable systems that are reach with resources. If you run out of options, send out probes to discover new constellations. More scout ships means more probes – from time to time, send out a fleet of 3 ships commanded by a hero. 3. Colonize the most relevant systems. Look for systems that have many habitable planets or that have a lot of resources. Some of these planets may be home to many anomalies, which may render colonization rather futile. Colonize planets closer to the capital, which will help them reach the “colony” status sooner. 4. Technologies. You will have to decide which inventions you find more useful pretty early in the game. If pirates and hostile factions are giving you a hard time – invest your time and resources into industry and weapon modules. Your civilization is small and/or isolated? Look into upgrading engines and accessing new methods of travel. Having hard time finding a habitable planet, or struggling with unhappy populations? Work on terraforming technology and improving happiness. 5. Consequent policies. This may be challenging, but the more often you opt for the same party, the more advanced rewards you’ll have access to. Each party has their own progress bar. It really pays off to follow through a single option so make sure to sort the priorities at the beginning of the game, so that you will be able to realize them. 6. If you need a stronger fleet work on discovering news hip classes or improve the size of the fleet with command points. Installing better modules and hiring heroes can also help. If the enemy is blocking your system, it’s sometimes wiser to hold fleets in hangars until you manage to assemble appropriate forces. 7. Conquer smaller factions close to your borders. This is the easiest way to expand your empire. Focus on military or diplomacy and you will be able to conquer/assimilate the given faction. If you’re the first one to assimilate a faction, you will be able to control it and get an assimilation bonus for the whole empire. 8. Heroes. Make sure they’re not idle. This gives them experience and each of them has some useful skills. Specialization is a good idea – example: assign only those skills that work inside a system (for governors) and improve the industry, or only those skills that impact fleets and improve space combat. The more they work the more XP they get. Their ships can be improved for a payment in Dust, which is expensive, but also allows to boost the ships instantly. Make sure you’re making new agents – those are valuable assets. 9. Keep track of the races that inhabit your systems. There are many races that can provide additional income if some specific circumstances are met, such as if the planet is fertile or anomalies occur there. Some races require other races to function, such as the Craviers, who use other as their slaves – they become better workers, but a planet is slowly being depleted and the happiness plummets. You might sometimes want to move certain races to other systems, where they will be more productive. You have to raise the System Development parameter to be able to use the space port for transportation of passengers. 10. Strategic resources are imperative for production of ships and modules. Then, the luxury resources are used for system development, or increasing the number of citizens. They can also be used to bribe unhappy populations or just to trade with others. 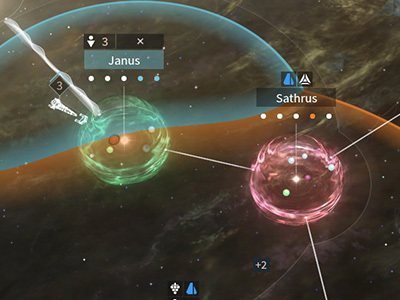 Both types of resources provide local bonuses for planets. 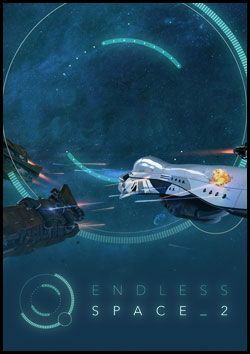 Endless Space 2 is seemingly just a typical 4X game, however, it contains an incredibly high level of detail and the player can quickly become lost among the countless options and sources of different benefits to the empire. While starting each game you should definitely keep several things in mind, especially if this is your first encounter with this game. 1. Select the human faction (United Empire) for your first playthrough. This way, it will be much easier to manage your empire. They employ classic solutions, their ships have the ability to mount larger numbers of modules, and they use Influence (one of the basic resources in the game) for the purposes of speeding up production, research, etc. They can also colonise a greater amount of systems before reaching the approval penalty, which is connected to having too many systems under your control. Alternatively, you could pick the Sophons (bonuses to exploration and science) or the Horatio (greater population of systems, upgrades to your population but more expensive vessels). 2. In the game you will often encounter the concept of FIDSI. This is an abbreviation for the five basic resources in the game: Food, Industry, Dust, Science, Influence. Food, Science and Industry speak for themselves, but Dust is the primary currency when it comes to buying resources or accelerating production. On the other hand, Influence is used to expand the borders of your empire and is also used during negotiations and diplomatic talks. 3. Systems are the basic territorial unit (the equivalent of cities in Civilization, provinces in Europa Universalis or planets in Sterallis), and not the planets in the systems. However, the more planets in the system, the better. Such a system will accommodate more population, will provide better FIDSI income (basic resources) and will have better chances of anomalies or strategic and luxury resources. Each planet has a different set of bonuses to the relevant FIDSI branch and to the approval. In the system itself you may juggle population units at will, especially since almost all races have specific bonuses to production on certain types of planets. 5. … Begin with exploration! This will help you find out which planets may be even more valuable (or less). You can often find a lost population unit or a new module for your ships. Each exploration ship (with the magnifying glass icon) has several probes on board. They restock every few turns depending on the advancement of the module. You can send the probes to a planet with a curiosity or launch them out into the unknown (they will uncover terrain for several turns). At the beginning you will only be able to travel by using star lines between the systems, but given time you will unlock Free Movement for your ships, which will allow you to reach the most isolated systems. It is worth building several of these ships at the beginning of the game, and even creating a small exploration fleet in the process, which will make it possible for you to handle e.g. an unexpected pirate vessel. 5. In order to colonize you need a colony ship (usually). Most races use the classic colonization model: build a colony ship, send it to a given system, build an outpost, and help to develop this outpost until it becomes a legitimate colony. I wrote usually, because some of the factions have different methods of settling, but you will find out more about this in the descriptions of particular races. Unlike many other games, when you build a colony ship it does not drain a unit of population from the native planet! The outpost encourages migration or tries to “grow” its own population. Thanks to this, you can produce colonization units without fear of reducing your own population in your system. If you find that you have unnecessarily settled a given system – use the “evacuation” command. You will get a colony ship at the cost of the entire population and the improvements that you have already constructed. 6. Modules are the elements of each ship – armaments, armour or shields, additional equipment (engines, probes, etc.). You will gain more powerful ships not by unlocking a better unit, but by unlocking new, more advanced modules and installing them onto a ship. 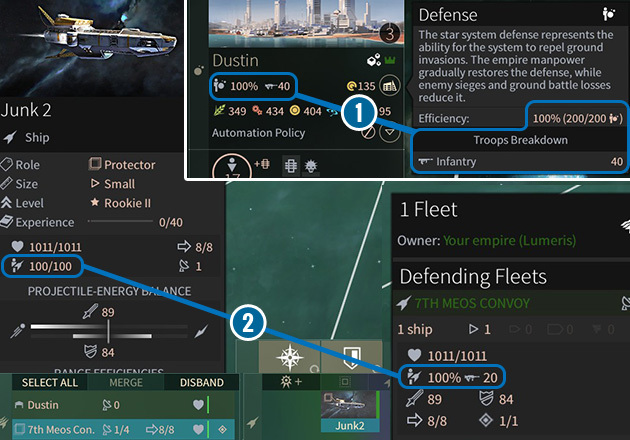 In a separate ship design menu you can decide on the quantity and quality of the invented modules. You can also discover new hull-classes of ships, which will often have more hit points and modules, as well as denser module slots (e.g. you can mount weapon modules in a given location, but they will count as double). 7. Another simple way to increase the power of the fleet is to increase the Command Points. Each fleet has a limited number, which affects the number of ships in the fleet. Only one fleet can face off against another fleet in a battle. Only after the skirmish comes to an end can another fleet join the fray. Therefore, even a small, but strong fleet can overcome several fleets of the enemy, one by one. Some technologies will allow you to develop this modifier, which will allow you to make up for the firepower by having a greater number of vessels in the fleet. 8. Pirates come from neutral systems belonging to minor factions. They will appear from time to time and circulate around the system looking for a fight. Until you conquer or assimilate such a system, their fleets will be created every few turns. Their quantity will be limited and the size of the fleet depends on the size of the neutral settlement. The more minor factions, the more such groups will travel throughout the nearby area. 9. Make sure to have the adequate administrators and admirals (heroes). It is better to have specialists than universal agents (although one or two “fillers” will always be useful). Heroes have access to many development paths, so check out all of the options and pick one of the two paths, that I am suggesting. The Admiral is a character, who will develop only fleet related skills and will lead your best ships into battle. The Administrator is a hero, who will focus on increasing the profitability and productivity of your best systems or of the ones which have just been settled (in order to accelerate growth). You may, however, assign one or two skills from the opposite branch of the skill tree, in order to make the characters more useful in times of peace/war. 10. Cold War – the diplomatic status you have with every newly encountered civilization. You can attack enemy fleets outside of their sphere of influence and block/invade their systems if they are within the range of your influence. This will affect your relationship with the given race. Increased generation of Influence (purple star symbol) in a given system can expand your sphere of influence. Thanks to that, you will not only gain a reserve of diplomatic currency, but you will also be able to take over the enemy system in a peaceful manner (or in the already mentioned military manner). In addition, if an asteroid belt or a nebulon field is within the range of the influence of your system, you will receive its respective bonus. 11. In the later part of the game you can get the access to terraforming option. Thanks to it you can not only change planets so they become more pleasant but they also will have more space. However, this process changes your FIDSI profits – the more pleasant worlds such as oceanic or terran have a good Food production but the bonuses for other resources are much smaller. Repulsive worlds such as lava or arid have the biggest bonuses to Production and Science per capita. Sometimes, those planets can have anomalies that can make living on those planets easier for citizens or have luxury resources that can help in production or increase Approval. There may be situations in which you are forced to colonize a repulsive world to get a rare strategic resource. 12. Minor factions (marked by dark grey color) are small civilizations that inhabit single systems. They don’t create fleets, although they are full of pirates. On the other hand you can have diplomatic relationships with those small civilizations and create an alliance if you have the best relations with a given faction. By doing that you receive Dust, Science points, Manpower and you can even get luxury resources. With a full relationship bar you can also assimilate a faction which allows a system and its citizens to join you in a peaceful way. Of course, another option is to declare a war and invade such system if you can’t assimilate them in any other way because a different empire has already established the best possible relation. 13. The more representatives of a given faction you have, the better are the bonuses from Collection Status. Usually they appear when you have 12, 20 and 50 representatives of a population in the entire empire. The first one is a fixed bonus to ideology if a representative is in a system. The next bonuses are more diverse: a percentage bonuses to a FIDSI resource, bigger Approval, a unique law etc. The game usually rewards those players that have many representatives in a system. Some laws and upgrades offers you a bonus for each type of population in a system. On the other hand, it is hard to get more than one full bonus because of a population’s size. 14. Carefully select weapon modules and enhancements. In the beginning of a game you should simply invest in the best weapon module or have a similar amount of kinetic and laser weapons. Thanks to that even if your enemy has, e.g. a thick armor you can still hurt them with lasers. This also applies to additional modules. If you have a module that enhances energy weapons then you should only install this type of weapons on that ship because this allows you to maximize the firepower. Better modules require technologies that are based on strategic resources. They are easy to differentiate – a module’s color corresponds to a particular strategic resource. If the color is white then you don’t need additional resources. Notice, that bigger ships requires strategic resources to even create a ship’s hull so before that you should first seize a suitable system or buy resources from the Marketplace. 15. There are many ways that lead to victory. Some civilizations are better in winning peacefully, others can do great during wars. Bonuses given by representatives of main race’s population also have a big impact and can determine your play style. Remember that each civilization has a series of unique quests that offers bonuses that are impossible to get by other races. A new hero, a unique weapon module, System Development technology or a bonus for the entire empire. It is worth to complete all of those quests because they can greatly strengthen your civilization. From time to time you can get a random quest or you can get one from a minor faction that allows you to assimilate them faster. Sometimes you can also receive a quest with a time limit that is given to all civilizations, e.g. who gets the most Science points. FIDSI are the basic means needed to develop your empire. Many buildings provide bonuses to a certain branch, but only a few grant greater yields of all five resources (an example of an improvement in the bottom right corner). The materials identified by the abbreviation FIDSI are the five basic resources needed for the development of your civilization. On every planet, your population contributes to the production of these resources. There is no distinction between farmers, miners or scientists. One unit of population produces a whole range of products. Their amount depends on the planet you colonized, e.g. lava planets provide greater amounts of Industry, while arctic world are better suited to the generation of Science points, but in both cases the yield of Food is marginal. 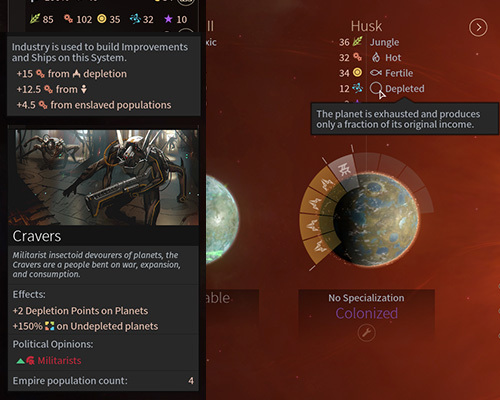 These modifiers may change if the planet contains anomalies, strategic or luxury resources, or when you place appropriate buildings that can improve the overall score. You can also assign populations that have special abilities (e.g. Sophons have a small +1 bonus and +3 in cold environments to the generation of Science points). Some structures (or events) can change the final yield by an extra/negative percentage value (e.g. + 10% Science for a system). Some specific structures increase the generation of several resources, e.g. Microwave Pipes (system improvement), adds 2 points to FIDSI, that is, to all 5 production areas, per one unit of population on the planet. Food – it is needed to feed the population in the system, to increase the population (in the system or in the colonies) and to replenish the manpower used by the army. Industry – necessary for the purposes of construction of new buildings and ships. Over time, you will be able to “produce” projects that will turn your Industry Points into another FIDSI resource. Dust – the currency in the universe of Endless Space. It is necessary, because you will use Dust to pay for the upkeep of buildings and fleets. It also serves to buy resources, ships and heroes on the marketplace. You can also use it to speed up production in a given system. Science – you will use it to discover new technologies that will ensure the development of your civilization. Influence – the production of this resource contributes to expanding the sphere of influence around the system. The greater the value per turn, the quicker the borders will expand. It is also the specific currency you will use for the purposes of diplomacy and negotiations. Every inhabitant of the planet produces a whole range of resources. 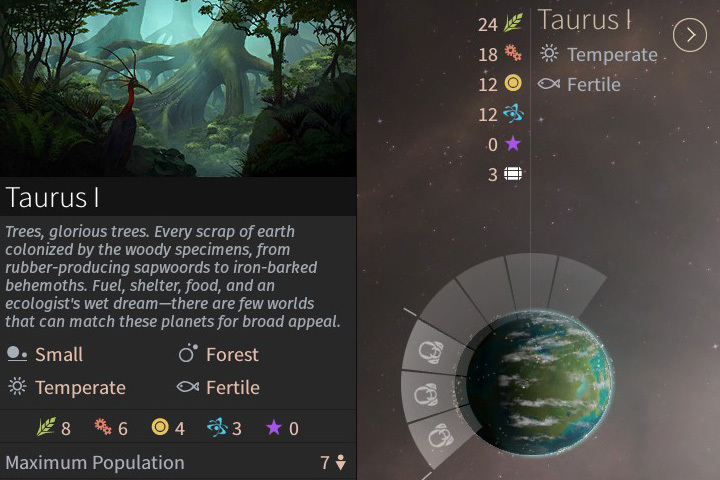 For example, a small forest planet produces per a unit of human (or alien) inhabitants – 8 units of Food, 6 units of Industry (normally 4, but the additional 2 comes from the presence of the Jadonyx luxury resource), 4 units of Dust, 3 units of Science and 0 units of Influence (see the picture above). Since there are 3 units of population on the planet, you receive three times the value of the basic FIDSI yields, namely 24 units of Food, 18 units of Industry, 12 units of Dust, 12 units of Science (the planet only has Sophon population on it; they have a +1 to Science bonus, so you receive 4 per unit of population, not 3) and 0 units of Influence. The more population, the greater the profit. The result from each planet is summed up and you will receive a total revenue per system. Only this value is then changed by other improvements that affect the system. Next, bonuses for race, type of planet or climate are added up. Then, you get bonuses that are given as a result of other values that are based on the entire system such as number of planets in a system, System Development level, do you have strategic/luxury resources or is there a trade route. After all of that this value is changed by upgrades that have influence on the total FIDSI profit, e.g. a percentage bonus to the overall income of a given resource or additional income if your citizens are happy. Approval is a very important factor in the game. Colonizing a system with a single planet, which has a quite unfriendly environment, is usually a bad idea. This is a very crucial modifier, that can be placed alongside FIDSI. Approval dictates how effectively your people will do their jobs. Many buildings and improvements will give you extra bonuses if the residents are happy or euphoric (more than 90% approval). On the other hand, low approval or the lack of it leads to many obstacles, including revolts and rebellions. If one or more systems maintain very low levels of approval, this can lead to the creation of a separatist faction, which you will have to fight and put back in its place. 0-10% Mutinous, minus 75% to Food and Influence generation. 10-30% Unhappy, minus 50% to Food and Influence generation. 70-90% Happy, extra 25% to Food and Influence generation. 90-100% Ecstatic, extra 50% to Food and Influence generation. Your empire also have an indicator that shows a global Approval. This number is the average of this value from all of your planets. Here, you can also get bonuses from population’s Approval in the form of a percentage bonus +15% to Dust and Science across the empire and +30% if they are ecstatic. If the Approval lowers to similar percentage range you get penalty to Dust and Science production. As you can see keeping your population happy gives you only bonuses so it is worth to ensure your citizens’ happiness. There are many ways to improve the approval in the system and in the empire. First of all, choose planets that have friendly environments and are good to live on, e.g. the following types: Forest, Boreal, Atoll, Jungle, Terra or Oceanic. Also note the anomalies that occur there. The first thing you can do is to build the appropriate buildings, e.g. the Infinite Supermarkets that gives +20 to Approval or the Obelisk of Remembrance, +10 to Approval and +6 to Influence (Unique structure; you receive it as a result of one of the random quests). 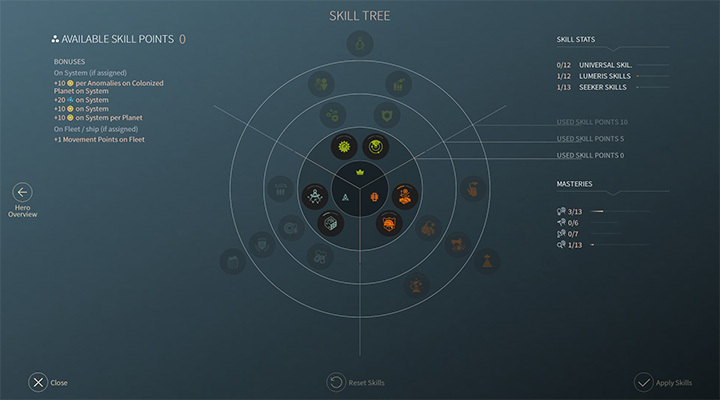 In addition, the heroes often have skills that affect the approval in the system (“green” general skill tree or race skill tree). Some luxury resources also give you a bonus to approval, e.g. Transvine, +40 on the planet or Blucap Mold, +10 (additionally +1 to Food and Dust per unit of population). Remember, that you need to have control over the planet and it must be colonized by you, so that the effect is imposed on the system. Some luxury resources can be added as a component to a higher level of System Development, which will also improve the approval of the population if you build a given System Development Level. Additionally, some races have bonuses of their own, where e.g. the Kalgeros minor race gains +2 points of approval for each member and another +4 if the representative of that population resides on a fertile planet (up to +6 on the correct planet per a representative). The ruling party also has an impact on the approval of the population. When talking about population, if the favourite ideological group of the population is a part of or is leading the government, then the system also gets a bonus to approval (e.g. most of the population are Pacifists, and the Pacifists are also the Ruling Party). This bonus is scaled to the amount of population and the support for the ideology. The last group of positive effects are the characteristics of races (the Lumeris have the Optimistic II trait, they gain +20 to Approval in all systems) or the impacts from random events or race specific events. On the other hand, there are a lot of negative factors, that will not affect your population’s approval positively. You can easily avoid this, if you are wise in your plans to build and develop your empire. Avoid settling all systems at the beginning (if you have such an opportunity), especially those, that have only nasty, barely habitable planets, such as gas giants, ice, lava or barren planets. Pay attention to what anomalies are present on the planets. Mixed anomalies can be fairly quickly neutralized, however, to get rid of the negative ones, some of the highest level technologies will be necessary. Overpopulated planets also subtract approval points. In this case, you can only emigrate population units elsewhere (to another planet in the system or to another system), expand the planet to be able to house more population or introduce pacifist rights, which will negate this problem (but it is difficult to get, because the party must be elected very often, in order to unlock this right). Over-colonization is also not a favourable factor for the approval of your population. The more systems you have over your limit, the bigger the penalty that your systems will receive. You may discover appropriate technologies that will increase this limit or abandon systems that you consider least useful. In addition, some events or quests can lower the approval in your colony or in your entire empire. The population of a given system may also feel dissatisfaction when their party is not a member of the Leading Political Parties in the system. A truce refusal, also results in negative approval throughout the empire for some time. Approval status – Mutinous. If you allow for a situation, where the approval of your subjects falls to 0-10%, they will start to rebel (1). Next to the state of approval you will see a time counter until the outbreak of the rebellion. You now have two additional buttons (2): suppress, that adds extra turns until the outbreak at the expense of population, or seduce, which will allow you to spend a certain amount of luxury resources to please the locals. In addition, you can counteract the situation in the following ways: build additional buildings, bring a hero (who improves approval) or reduce the population in the system. On the main screen you will also see a counter above the system name (3). Apart from the number of remaining turns, you will also see a circular red indicator, that will remind you of the remaining time until the unpleasant event. If the time until rebellion is up, a fleet will appear in orbit and will attempt to conquer the planet (4). The fleet will start a blockade and then invade the planet. If they are successful, the system will become hostile to all factions, though no negotiations can be started with it (the bar with the planet’s name will become light grey, where other neutral planets have a dark grey label). Only the military solution remains valid. You must now send the fleet and conquer the system to regain control. To avoid having to invade the planet, you should send a strong fleet over the planet in advance. It will deal with the rebels in space before they can attack your system. Manpower is the numeric value represented by the icon with 3 people. It determines how many soldiers you have on duty and in reserve. If you played the games from Europa Universalis series (or similar) you can quickly see the similarities. The Manpower is required to operate your ships as its crew, they are the core of the defense and invasion forces. Ships with a full crew do better during space battles. If you are out of Manpower you can’t build new ships and you can’t replenish your garrisons in systems or make invasions. Even if you don’t have any military goals you need a certain amount of Manpower – they are necessary in producing scout or colonizing ships. When a battle breaks out the Manpower is used to make squads. You don’t need to create separate units that are used for invasions. If you see a character with a planet/system icon then this means that this is a system garrison and a space ship icon means that this is a ship crew. On the Military Status screen, in the side panel, you can see how many Manpower you currently have and its maximum number (1). Below, you can see how much Manpower is used to resupply fleets or systems. The maximum number increases with every system owned. The third value is your net increase. 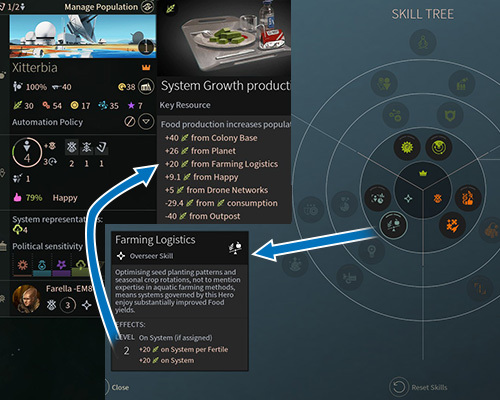 The Manpower value is increased by producing Food on your planets, you can see the values from every system (2). In each system, under FIDS indicators, you can check the garrison’s status presented in percentage and the number of armies that are stationing there (3). If a system needs to resupply a garrison you can notice a half-transparent ring around that system which gets filled by taking the Manpower from the overall pool that you currently have (4). Manpower simply appear in your territory, they don’t have to be transported by ships like migrants. However, blockades and invasions stops all resupplies. Fleets can resupply their Manpower a little bit during a turn but this process is much quicker in a friendly system. The initial options that can help you raise your Manpower. You can use a special project called Chain Gang Program that “consumes” one population unit in a system and converts it to 300 Manpower units. This project is useful in crisis situations and in overpopulated systems with a high Food production. Thanks to that you can quickly regain a lost citizen without an impact on that system’s economy. 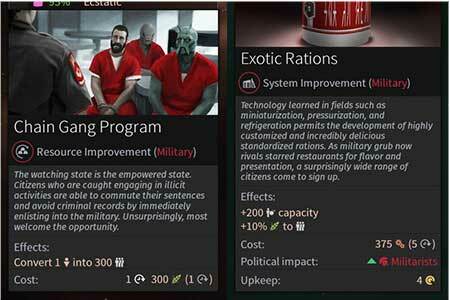 This also allows you to quickly get another system improvement which is called Exotic Rations. It expands a system’s garrison and grants you an increase in Manpower from Food produced in a system. Besides that there are other technologies that increases the number of garrisons, their resistance during fights, increases Manpower production, speeds up resupplies in fleets/systems or increases the number of troops on ships by using particular modules. Military power is created by the number of sailors/crew (the icon of a person with a small ship) on a ship or garrisons in systems (the icon of a person with a small planet). The number of soldiers on a planet or in fleet is a certain amount of Manpower. To make 1 ground troop you need 5 Manpower, 1 armored unit requires 15 Manpower and 1 aerial unit costs 30 Manpower. If your army consists of only ground soldiers and your fleet has 300 sailors in total then your military power when attacking a system is 60 soldiers. If you change your army to 50% ground units and 50% armored vehicles then, during an invasion, the same fleet will have 30 soldiers and 10 armored units. Remember that some weapon modules can kill crews during space battles. In the example above you can see a system that starts with a garrison with 200 Manpower so it has 40 soldiers (1). However, a fleet that has one ship and its crew consists of 100 Manpower is worth 20 soldiers during an invasion. 6 main strategic resources. The most commonly used are the two from the first column while Orichalcix and Quadrinix are very rare. Titanium and Hyperium. You can find them easily whether as ready to be mined deposits or as a loot during exploration. The first few technologies allow to use them in creating better modules and ships. Adamantian and Antimatter. They are hard to come across and they are used in the development of technologies that are in farther, middle tech trees. Modules that are based on them are more powerful the preceding ones. Orichalcix and Quadrinix. Very rare minerals. They are hard to mine, even finding a system that has their deposits is difficult to find. They are used in production of the strongest ships and modules. 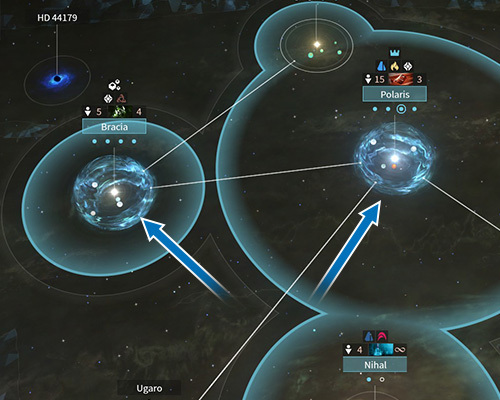 Resource deposits may vary – in one system you can only get one unit while in other system you can get a few during one turn. You only have to own a given system and colonize a planet on which you can find a resource deposit. You must develop a technology from Economy and Trade that allows you to mine those resources. Only then you can get them moved into your warehouse. In the main screen you can see the information about your resources (1) in warehouses (those that are mined are highlighted). In the Trade screen you can see the status of the luxury resources (4). In each turn you get resources delivered to your warehouses. They are not kept on planets or systems but they are gathered in the overall pool of your empire and are taken from it when you begin a construction of a ship or an upgrade. In the upper left corner, in the status screen (1), you can see the amount of your resources. If the resource icon and the number is underlined it means that a given resource is mined. On the screen you can see the places where known resources are but they are not currently mined (2) and systems in which the resources are currently mined (3). 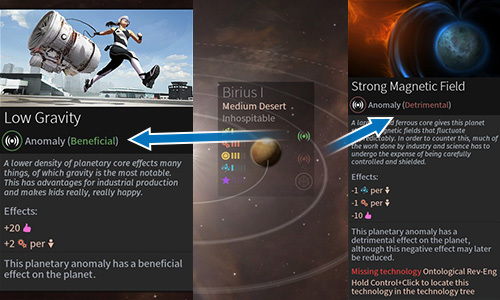 In the first case the resource icon above a planet is slightly translucent and in the second case the icon is fully colored. Remember that you can trade those minerals in the Galactic Trade Center but only if came across a given resource. You can’t buy unknown minerals. Because of that it is important to explore the galaxy as much as possible. Thanks to that you can discover new places that can be mined in the already known systems. On the economy screen you can see the amount of luxury resources (4). They are assigned to columns corresponding to a given group of bonuses to which they are connected to. They can be used in System Development (5), a special upgrade for your systems. Some of them give you a fixed value, e.g. +50 Dust in a system, other can give you +10 Dust per citizen in a system. You can assign only one resource to one level of the System Development (you can’t assign two or three of the same ones) but one type can be assigned to each level to combine effects. As presented in the picture, in order to upgrade the System Development to level 2 I used RedSang (+50 Food) and I did the same with the level 3. The effects of both levels combine in a system which means that I’ll get +100 Food in that system. A proper use of luxury resources can fill in the gaps in your empire or make it even stronger in a given filed. These resources can also be traded but only when you discovered or acquired them. Besides that you can use them when the citizens are revolting (the Approval is very low). When this happens a random resource is selected. Each race has its own favorite resource (6) which can be used to encourage them to increase the population. 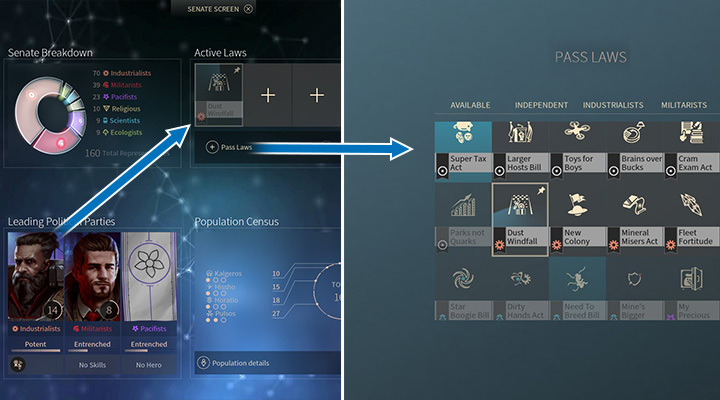 You can see it in the Population Overview which can be accessed by selecting the Senate Screen or system overview. The greater population in your empire the more resources you must use to encourage them. A question mark next to a race means that you don’t have the access or you didn’t found their favorite resource. 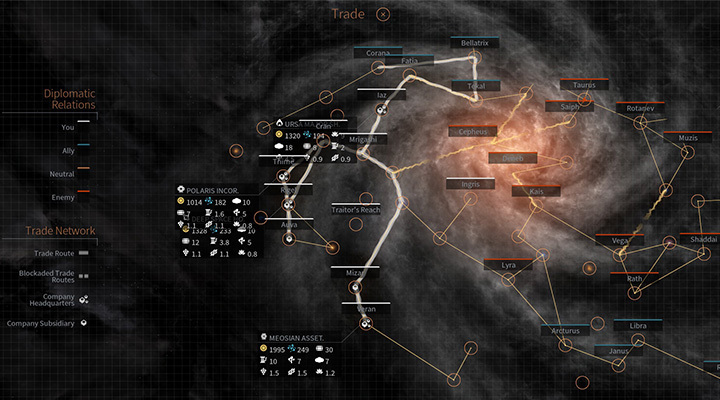 The game offers a lot of different ways which allows you to move in systems and constellations. A system in the game consists of a star and celestial bodies that surrounds it. Above each system you can see its name and a number of planets which are presented as a small circles. If they are empty then you can’t colonize them in this moment. White circles are planets that can be inhabited and colored ones shows that they belong to a certain civilization. If a system’s name is also in color and you can see an influence circle (1) it means that this system is under control of an empire. If a name has no color (2), even if it’s in the influence circle, then this means that this system belongs to no one. Around Dustin system (1), presented in the picture, there are many Star Lanes and around the solar nebulas (3) you can see Wormholes, more about that later. Most of the systems creates constellations – a cluster of systems connected by Star Lanes. If you zoom out you can see names of those constellations (5). Some systems are close to constellations but they are not connected with them in a such way. You can discover them by sending probes from your scout ships. 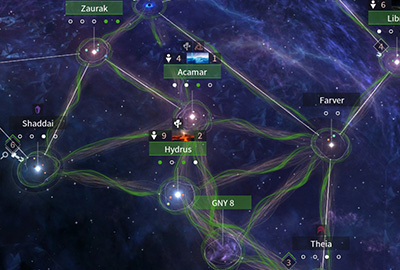 Constellations are often further away from each other, although this depends on the type of the galaxy that you chose in the beginning of the game. You can also find systems that have no star or planets. They are asteroid belts, black holes or nebulas. You can’t colonize those places but if they are in your influence circle you’ll get some profits from them. When this happens a color of that place changes into the colors of your empire (no. 3, the system on the right called 3C 75). Many systems in your empire can use those special places (the nebula 3C 75 in the reach of Dustin system, as presented in the picture). You should plan your colonizations carefully and invest in gaining Influence points if you want to get profits from those special systems. Star Lanes. The most basic way of moving your fleets. Systems are connected by white lines which can be used to travel, rather fast, between systems. During a journey you can’t turn back a fleet or attack other ships. Free Movement. When you discover the technology from the second tree, Baryonic Shielding, you get the access to an upgrade called Warp Drive. From now on you can send your fleets to systems that are not connected by Star Lanes. Here, a journey takes longer when compared to other methods but often this is the only option (in the picture you can see a fleet moving from Zoltan to Mintaka (6)). 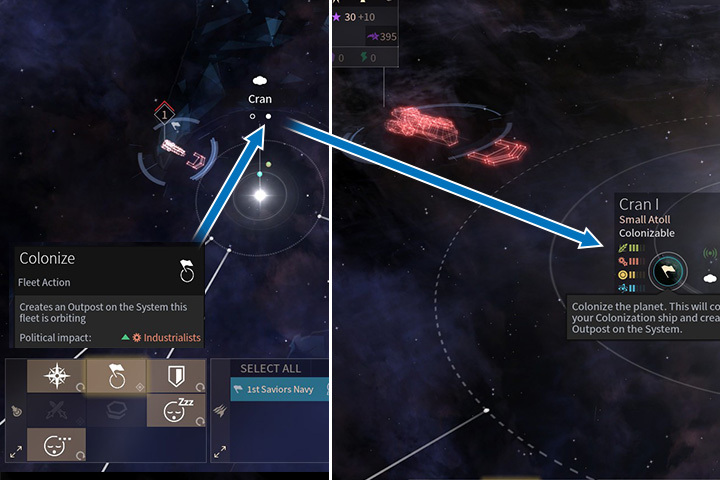 If a fleet calculates that it is faster to fly through void rather than a few systems (even if they are connected by the Star Lanes) then it will choose the shortcut. You can speed up the movement by researching the technology from the second-to-last tree, N-Dimensional Topologies. Wormholes. After developing the technology called Applied Casimir Effect you unlock and get the access to new system connections thanks to a new bonus – Hawking Radiation Dowser. Usually, connections will appear between constellations. Fleets move very fast. It uses all move points but the distance has no impact on the travel time. The characters in this game are buisy people. Hadri Lenko (1) during peacetime runs one of your systems (2) and commands the fleet (3) during war. Special heroe units are at your disposal. Those are unique agents of your empire, who offer a range of services and have special skills (1). They can improve the performance of your systems (2) or take command over fleets (3). They can also represent the Party in the Senate. As the admins/governors of your systems, they can improve production per capita, per planet or just boost the FIDSI factor (happiness). They have their own ideologies that influence their choice of parties and the way the inhabitants of their system think. As admirals, they improve mobility and sensor range. They can increase number of health points of units or make certain kinds of weapons more efficient. Each of the heroes has their own ship which also takes part in battles. After every assignment, a couple of turns have to pass in order for you to be able to reassign them. Transportation is instantenious, but they can only head to friendly systems or fleets within them. They are absolutely loyal, their race – even if you’re waging war with that race – has no detrimental effect on their work or reliability. Hadri Lenko, apart from running different systems and fleet, also runs his party – the Militarists. The Party currently holds the power, but Hadri has no skill to take advantage of this. Each hero has their own ideology, which he adheres to, same as the citizens of the empire. The heroes become political leaders, i.e. the representative of the given part (if it doesn’t already have a leader!). It’s pretty important, because some of the most powerful skills only work if the hero who’s running a part is in the senate or his part is the Leading Party. Example: you get your first hero. They are a militarist and become the leader of their party. In time, you may get another militarist hero, but he won’t become the leader, for obvious reasons. The third hero is pacifist. You don’t have any pacifist hero yet, so he becomes the leader of the pacifists. 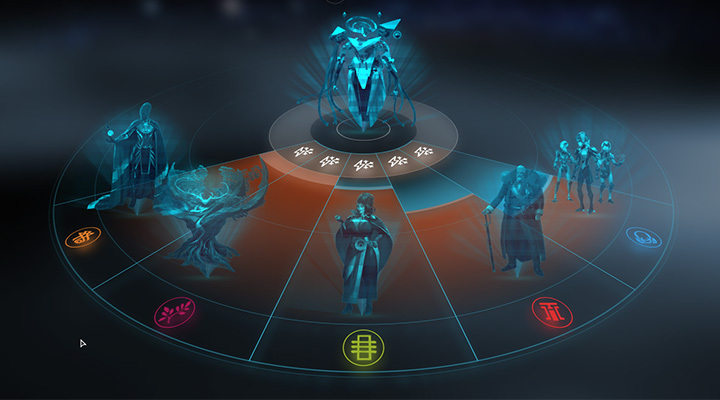 Each hero has three skill trees, to which you can allocate skill points, gained with every level. Every active hero (assigned to a system or a fleet) uses up the Dust, in quantities corresponding to their level. During battles, the heroes cannot die, and they cannot be dismissed. They can, however, be unassigned – then, they’ll get back to the general pool of heroes, where they’re inactive and don’t get paid in Dust. The information about them can be found in the Hero Management tab. Performing basic tasks, such as discovering new systems, waging battles, building ships, etc. All of these add to the Hero Unlock bar in the Hero Management tab (more about that below). Additional info about what sort of heroes can you expect can be found in the Hero Management. The side tab contains three important indicators. (1) The first one is the bar. (1) This is the Hero Unlock bar. Everything you do grants you a certain amount of points added here, for example discovering new system, establishing an outpost, building a ship, diplomatic negotiations, bribing a faction, combat, destroying ships, etc. When it fills up, you’ll be able to choose one of three heroes. They races are random, but their classes are based on your actions. (2) Another important thing – Hero class probability. There are four bars, each is related to a different class. The actions mentioned above also add up in here, but they’re distributed between the four. The more technology you discover – the better the chances of getting a scientist hero; the more you fight, the more warriors will spawn, and so on. Your playstyle influences your empire and determines what kind of heroes you get. (3) The last one informs about the location of the Academy in the galaxy, as well as indicates the initial level of your heroes. Next to the name of the system, there is a button that allows you to instantly get to that location. If you control it, your men will gain experience more quickly. Besides that, you can also see how many heroes are there in other empires. The green one are general skills, which can be accessed by every hero. They can help with many different things, and can be chosen if other, more specific skills, don’t seem to meet the requirements dictated by the circumstances. The orange ones are race skills. Every hero of the given race will have the same skills available here. There are many of skills particular to a single race. The blue tree, are class skills. Those are dependant on the specific playstyle or a domain. These skills include skills of commanding fleets as well as managing systems. These skills can even influence the Senate of your empire. (1) Seeker. Focused on exploration and sciences. His ship has an equal ammount of weapon and support modules. 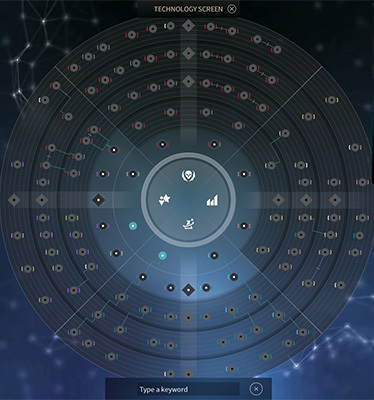 Unlocking seekers can be done mainly with discovering systems, factions, etc. (2) Guardian. Those heroes are focused on combat and industry. Their skills mostly aim at improving the fleet they command. Their ships have more weapon modules. Combat, war activities and some industrial actions help to unlock warriors. (3) Overseer. Responsible for developing systems and fleets, overseers are focused on defense. Their ships have more defense modules and can divert the attention of the enemy and withstand a barrage of fire. Any development you make in the empire increases the chances of unlocking overseers. (4) Counselor. Focused on diplomacy and gathering resources from systems. Their skills allow obtaining more Dust and Science – as commanders of fleets, they can decrease the upkeep costs. Their best skills allow to set the system’s happiness to the highest level possible, regardless of the circumstances. Sending ships and probes into various parts of the galaxy is very useful in the beginning of the game. Remember to install better probe modules or have more of them. 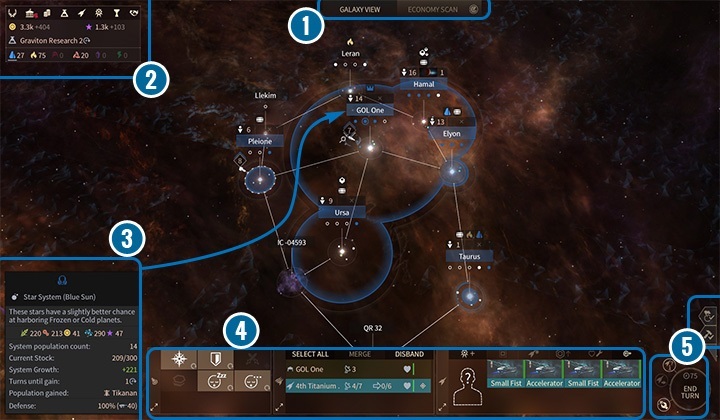 Exploring the galaxy is one of the basic actions during the first few hours of the game. The system that allows you to scan planets and discover their wealth was made in a such way that even in the later parts of your game you can still go back to exploring the galaxy. In order to do that you can use the special type of ship that has Exploration role (those with magnifying glass icon). Those ships are weak but, usually, they have a few module slots. A unique module, available only for this type of ships, are probes. Hero ships can also be equipped with that module. Although the upgrade is installed immediately it costs Dust and in the beginning of the game you don’t have a lot of the currency. The ships can move like other fleets which means that you can send them into unknown systems by using the connections between them. Probes renew automatically over time, you don’t have to return to friendly systems to resupply them. To use a probe you must press the special button in fleet’s menu. When you select a group with an exploration ship then on the left you can see the Launch Probes option. Thanks to that you can send a probe in the direction that you currently can’t or you don’t want to move. Usually it is a good idea to send a probe in a direction that you can’t currently move to or you want to be sure whether it is safe or not to move there. It is worth to build a few exploration ships and send them in small groups. Thanks to that it is easier for them to defend from pirates and they will have more probes. Later you can get access to better probe modules. Curiosities that can be found on planets, are randomly generated events (similar to, for example, Tribal Villages in Civilization 6). From the game’s screen you can easily locate those places. Under a system’s name you can find a number of planets. Those planets that are pulsating have at least one Curiosity to examine. In order to do that you need a ship with probes. You can now select Start Expedition option or you can zoom in until you see all planets in a system. Next to names and statistics of planets you can see Curiosity icons. When you click on the button you send a probe and on the screen you can see a window informing you about results. There are a few different Curiosities – sometimes they give you different effects but your chances to find something interesting may vary. After examining a Curiosity you can get positive or negative consequences. In most of the cases you get deposits of strategic or luxury resources and from time to time you can get a small amount of one of the FIDSI resources. You can also meet someone from other civilization that will join you (a civilian ship is sent to the nearest system that has enough living space). You can find good or negative anomalies on a planet. Sometimes, you can receive wisdom that speeds up your research on one technology or you can get a unique module for your ships (usually better than most of those that you currently have or can research). In some cases you may find nothing and sometimes you can find something unpleasant, like being attacked by pirates. New Eras of Science and Exploration (on the left you can see the first level) and new technologies (on the right) will help you to detect and send expeditions. Some Curiosities requires higher level of Curiosity Detection Level or Curiosity Expedition Power. You can often see a Curiosity but you won’t be able to send your people there. An icon for such Curiosity is darker and has a lock. This is a sign for you that you must level up said values. The only way to do that is to research certain technologies. Besides that if you unlock a new technology tree and you get the access to another Era of Science and Exploration you can get a better chance finding rare resources than you usually have. You should invest equally in that domain of research and in exploration fleet if you want to discover all secrets of the galaxy. A colonizing ship can be the first step to take over a system. The best way to do that is to choose friendly planets as your targets. White circles under system names can suggest you which planets can be inhabited. Colonizing new systems and planets is one of the most important goals in the game. Thanks to expanding your living space and territory you can increase your population and inflow of resources which in turn can increase your realm and chance to win. To obtain this goal you must use colonizing ships. Remember to select systems with very good planets or a lot of average ones. 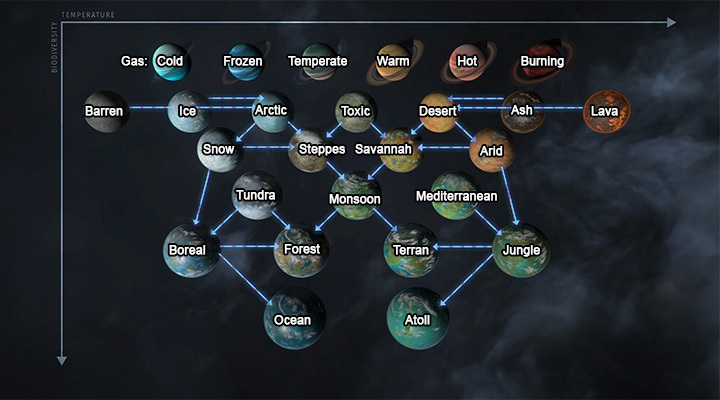 Oceanic planets or with a lot of flora are wanted by all races so it doesn’t matter which faction you play as because you must choose those planets as your priority targets during the expansion. They also give Approval bonuses which is also useful. With the development of technologies you get opportunities to inhabit more planets and even reshape them into something more favorable. You can also help Ecologists in your empire. If they are in power you can colonize almost all planets although with a penalty to FIDSI productions. In the beginning of the game you start with one ship of that type but there is nothing stopping you from building more. Especially because building colonizing ships doesn’t require population unit (unlike in the previous Endless Space game)! The colonization has two steps. First, you must find an empty system (one that is not under influence of other player) with planets that can be colonized. Such planets are marked in the game screen as white full circles (miniature planets) under a system’s name. When you bring your colonizing ship to a wanted place you can click Colonize option. That ship is used in the process of constructing an outpost which is the first step to settle in that system. Getting colony status takes some time. The second stage is to develop your outpost. Although a given planet is under your control, its system is still neutral. If there are other planets that belongs to no one, other players can colonize them. 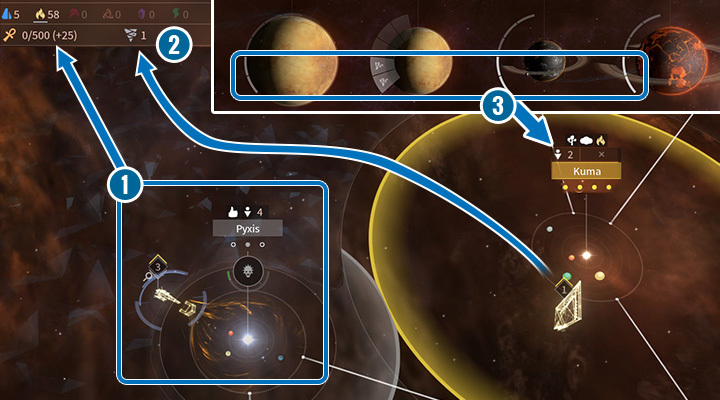 This is where a race begins – who can develop their outpost first gets the entire system. An outpost develops on its own. It creates the first population unit by gathering a certain amount of Food that it produces by itself (1) (base production of a given planet plus production of an outpost). Civilian ships with Food, that can speed up that process (2), will start flying on this planet. They start from your capital or system that you chose. But you must remember that those ships are defenseless against pirates and fleets from enemy nations. 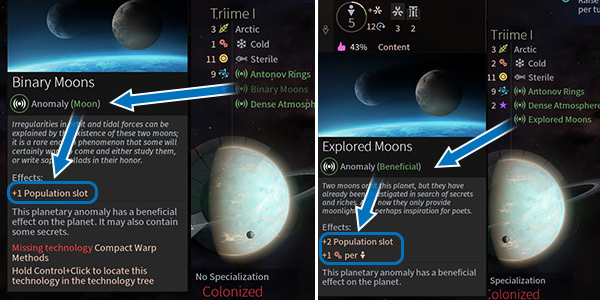 When you select that system then under a planet’s name you can see three options and a bar that shows how much time is left to get the first population unit (3). Next to it you can see an icon of a population that will appear there. Usually, it will be a population of your faction. (1) The first is useful when in a system there is an outpost that belongs to other civilization. By using a little bit of Manpower you can take Food from other outposts. (2) You can also fund the development of a colony and increase Food production rate by 100%. (3) The last option is to increase system’s attractiveness. By doing that more people will be encouraged to arrive in a new world. Most of the times you are going to use the second and third option. Funding Food production is the most useful in distant worlds where ships with migrants have to travel a long way. 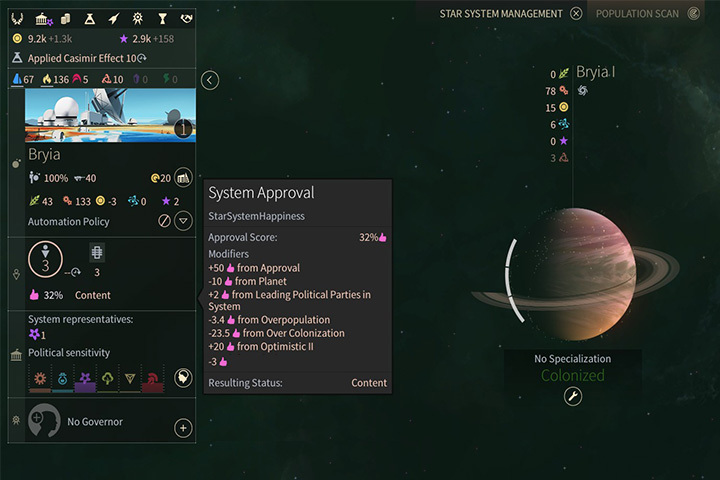 The second is perfect for systems near your empire because thanks to that you can take over a system in a very short time. When you get your first population unit in an outpost that system becomes part of your empire and from now on you can manage it just like any other colony. Inhabitants can only be moved between colonized planets within a system. Migration is an easy way to use the potential of a given planet or colony in a different way. 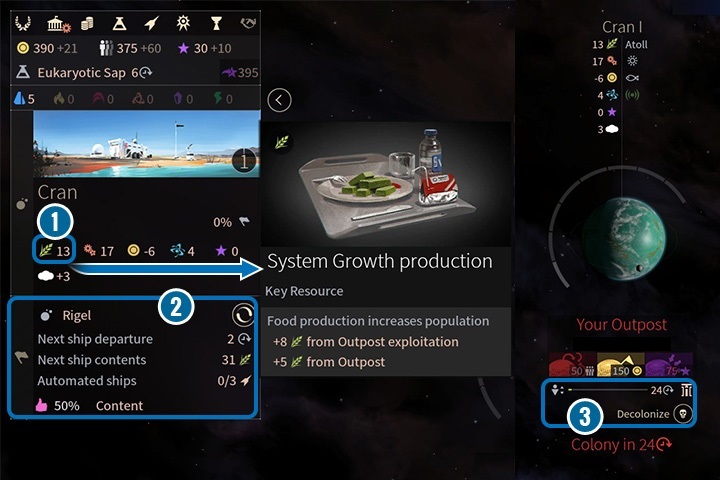 By assigning citizens to proper planets you can help in producing a particular resource or increase the Approval in a system by avoiding overpopulation. Migration can be divided into two types: interplanetary (in one system; you must have more than 1 colonized planet) or between systems. In the case of the first type all procedures are very easy. If you enter the system management option you can select population units that you want to move to a different colonized planet in the same system by moving the mouse cursor and holding LMB. Transportation process is immediate. You can do this over and over again until you are happy with the results. If the target planet is full and you want a specific type of population to inhabit it you have to do the same with population units. 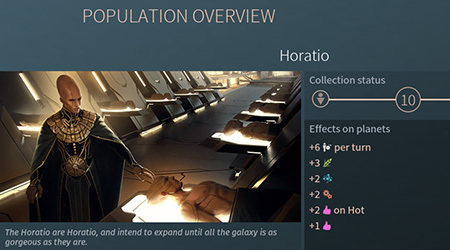 The game automatically assign the excess of citizens to other planet in the same system. A spaceport allows you to transport citizens between systems by using civilian ships. Migration between systems is similar although you need to have a better developed empire. In the system you must have System Development level 2. From now on you have the access to a new object in that system: a spaceport (1). System Development also gives you other profits but more about that in the dedicated chapter. Population units from planets in your system can be moved to a spaceport. Next, you select a target system and in the next turn a civilian ship is send there (2). Those ships are created automatically so you don’t have to build them by yourself (3). This fleet is defenseless and exposed to enemy attacks (for example pirates) so losing it may hurt. When that fleet reaches its destination the citizens are automatically assigned to colonized planets. This is very useful if you want to quickly inhabit new systems or free some space if your systems are overpopulated. The last option connected to inhabited systems is the Evacuation. Using this order allows you to abandon a system. You lose all buildings and population units and only get one colonizing ship. This decision can be useful if you don’t want your enemies to overtake your system, a system is no longer useful to you or you want to reduce the amount of systems under your control. Choosing the right planet is very important. Your people will work and live there, after all. Every planet has a couple of coefficients. The most important of those is the amount of FIDSI points output. FIDSI stands for: Food, Industry, Dust, Science, Influence. Apart from that, hazardous habitats of some planet will naturally have a negative impact on the happiness of the given population. Some of the planets also have strategic or luxury resource deposits and may have some anomalies. The resource deposits influence the FIDSI output and sometimes the happiness. The abundance of these resources, on the other hand, influences only some improvements. 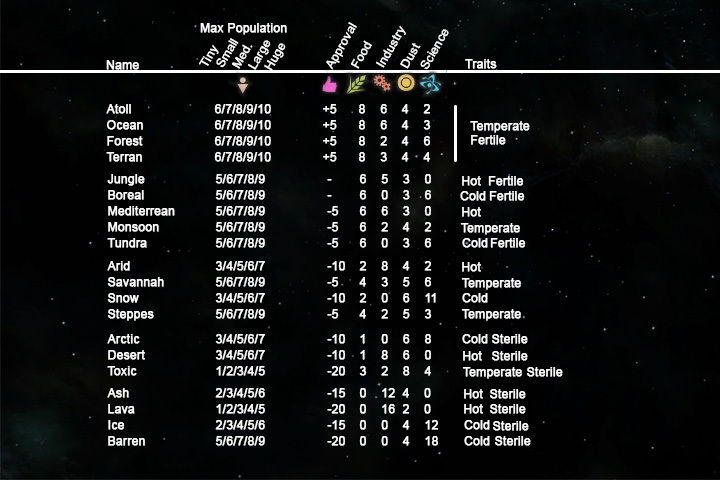 Some population units bonuses are related to the right climate of a planet. Sometimes you will have to decide whether the priority will be the bonus to production or higher habitability. The anomalies have various effects. You can often encounter anomalies in new systems or when investigating curiosities found on planets. The anomalies can be divided into: positive (green), negative (red) or the effects that have both up and down sides (gray) – those can be worked on to be more on the positive side (cobalt). In order to do that, you will need some advancements in the fields of Science and Exploration. For example, a positive anomaly is Low Gravity, and it grants +20 to happiness and +2 to industry and per capita. On the other hand, Strong Magnetic Field takes -10 from happiness and -1 per capita from production and science. These are just a couple examples, but they may often determine the planet to colonize. An unexplored moon usually has more population slots, but in order to extract the most resources, it needs to be investigated just like an anomaly. Moons. These fall into the category of anomalies. Usually, a bonus of a slot population is provided for the given planet, sometimes a bonus to different branches of industry occurs. In time, you’ll be able to build a research station and research the moons. This may in turn provide some bonuses that will further enhance production or population. Planets also have climate features (gas, cold, hot, temperate). The other set of characteristics is biodiversity: fertile and sterile. These influence the construction of some buildings, and can provide different bonuses to population as well. The planets can be divided according to the habitability factor. Sometimes, however, the less habitable planets will provide a bonus to FIDSI output. On the other hand, these usually have limited population capacity. 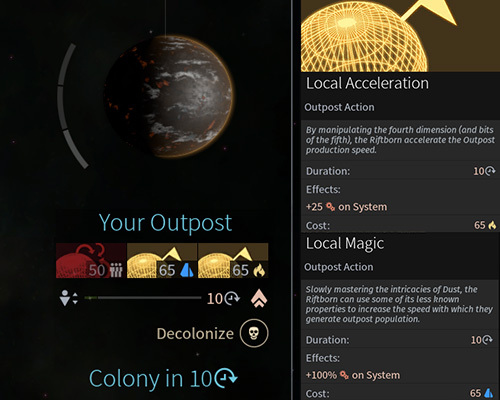 You may also encounter unique planets that provide specific bonuses regardless of the climate. In time, you will also be able to terraform planets, i.e. convert them into a different climate. However, you can’t back-terraform planets. The other characteristics of planets include size and type. The planets can be terraformed from the least habitable, to more habitable. The exception are planets which don’t allow any terraforming. The chart below shows all planet types that can be generated during a playthrough. Gas giants and unique planets are not included on the list. They cannot be terraformed, can contain only 1-2 population units, always subtract -10 from happiness and, depending on their type, yield only 26 units of Dust, Industry or Science..
Population capacity per size: tiny/small/ medium/ large/huge. When you look at the table above you can notice a some kind of division. Planets can be divided into groups that grant you similar bonuses to Approval, production or possibilities for terraforming. Most of the times you will want to have as many top tier planets as you can but sometimes it is worth to have those less favorable planets because of their bonuses to particular fields of production. On the other hand the less favorable environments give you less space that can be inhabited whereas bigger assemblies of citizens can give you comparable profits. Usually, hot planets have a bigger bonus to Industry and cold ones to Science. Worlds that are difficult to inhabit are sterile and those that are more pleasant and allow you to produce Food easier have fertile trait. Here, you can also find the rule that the more pleasant environment, the more citizens you can accommodate although your profits will be averaged. However, the least pleasant worlds not only have penalties to Approval but they also won’t have a lot of space for your population, although they can offer you good bonuses to specific fields. 1. Ocean, Atoll, Terran and Forest. The most capacious types of planets, they also give you Approval bonuses. They offer the biggest bonuses to Food production and a balanced production of other resources. Those planets are temperate and fertile. A lot of upgrades use planets that have those traits. They are the easiest ones to inhabit so they don’t need any additional technologies in order to do that. 2. Boreal, Jungle, Meditterrean, Monsoon and Tundra. Most of these planets can be terrafromed into one of the planets from the first group but not into all types. They have a considerable bonus to Food production but sometimes they won’t produce, e.g. Science or Industry. After some time you can obtain technologies that will allow you to inhabit these systems. All planets have different climate. They are also very capacious and pleasant, at least to the point that they are tolerable for your citizens. 3. Arid, Savannah, Steppes and Snow. They are medium quality worlds, although they are closer to the bottom of the list. Some have more negative impact on Approval and a weaker production of Food and other resources. However, a few of these planets have better bonuses than those with more pleasant environments. For example, Snow planet gives you a better Science bonus while Arid grants you better income in Industry. Thanks to science researches you can get the access to those worlds. This group often offers you medium class strategic resources. 4. Arctic, Desert and Toxic. One of the least pleasant worlds but they are still capacious enough for your people. Very low Food production. However, each one of these planets exceeds in producing one resource. This is a group of sterile worlds and, because of that, some of the buildings can offer you bonuses. Those planets can be terraformed into some worlds from the third group. 5. Ash, Lava, Ice and Barren. These worlds are either hot or cold and all of them are sterile. Many upgrades and buildings, for example those that can increase number of population, can only be used on these planets. Although the fourth group is very similar those planets are in a separate group because they can be changed into arctic (if they are cold planets) or desert (hot). Ash and Ice planets are a little bit more pleasant although less productive versions of Lava and Barren worlds. The second group gives you even more bonuses to Industry/Science. Here, you have no Food production and a very low Dust income per capita. They are the least pleasant worlds and the hardest ones to inhabit and because of that the maximum population is very small. You must also spend some time on developing colonization technologies. On the other hand they can be used as perfect worlds for being Industry or Science centers. It is worth to leave one or two of those planets in a system to have better FIDSI bonuses. 6. Gas giants. They are not planets and can’t be terraformed. As it was said earlier they offer a very big production but only in one field. They can often be found as the only object in a system, especially when a system has no star. They can accommodate a minimal number of population but they often have the rarest strategic resources in a galaxy. The population is the driving force of your empire. Without it, you won’t build any fleets nor settle down on a new planet. Each civilization has their own default representatives, but they can also come from other races – if only you engage in conquering or participating in different events. Fortunately, the race of a hero doesn’t influence their loyalty – only the happiness in the system does. Each new colony will initially be alluding to your own population. Only if in the given system a different population already exists is there a chance of that race growing in numbers on your planet. You can also spend luxury resources to incite other races to inhabit your worlds. Bigger populations of races allow to unlock more traits and bonuses. 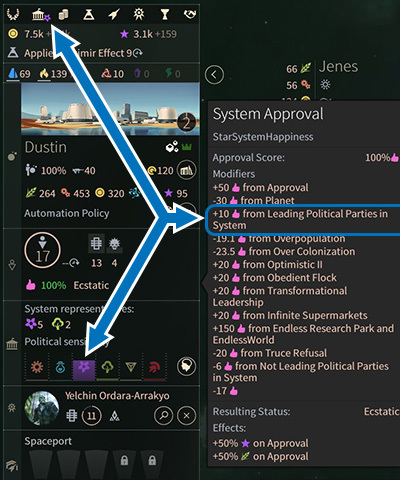 In the senate tab, you can find a shortcut to the population screen, also available from system view (if you click on a symbol of a race). 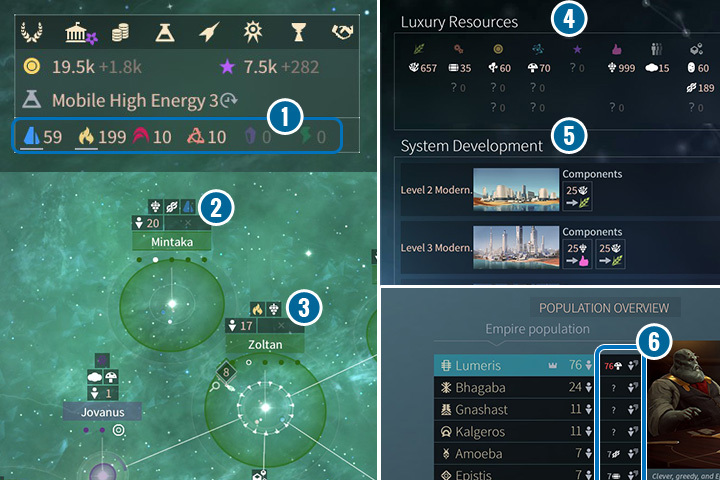 You can see here the numbers of other races within your empire (1), see what luxury resources will incite them to migrate (2), see planet bonuses (3) the Collection Status (4) which offers considerable bonuses if the number of citizens is bigger than 50. Then, there’s info concerning the influence of the aliens on the given party per turn (5) as well as their reactions to different actions and the situation in the empire or systems (6). Ideologies. Every race reacts differently to different ideologies (6,7). Every action influences the support for the given ideology, hence the given party. By hovering over the ideologies, you can see which actions influence voters of this party. For militarists support, you will need things such as building military ships, recruiting militaristic heroes or assigning them to fleets and systems, blocking or conquering systems and fighting in battles. It’s analogical for any other ideology. However, every race reacts differently to different ideological issues within the empire. Here things become more tricky. On the illustration (7), you can see a wheel for humans. Events of religion, pacifism or militarism have a direct influence on the popularity of that party. BUT – events for ecologists have only 50% of the influence, and events of the industrialists have a 200% influence within a system, and events for scientists have an identical impact on scientists and industrialists. Hence, it will be easier for the industrialists to seize power within the empire of the Imperials are the dominant race. The reason is twofold: the industrial events themselves generate more influence, plus any even in science also boosts the industrial influence. The citizens are happy if their parties rule. 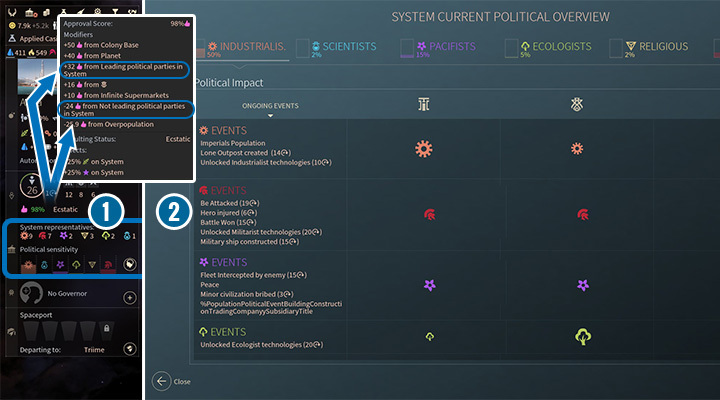 The actions and events that influence the support of a given race in the system can be checked in the System Political Overview window. If the supported ideology is not ruling, it negatively impacts happiness in the system and vice versa. If you’re not sure what sort of actions can improve the support of the population, you can check that. In the side menu, between the governor and population bars is the ideology support bar (1). There you can see how many representatives in the senate are there for the given party, and what is the current support for a party. You can click on the stats to get more info. Here, you can see what influences the support within the coming turns (2). The numbers next to the events tell you how many more turns will the given modifier be in effect. If there’s no number it means that the modifier is in effect until further notice. A single race gives more control over ideologies and facilitates management. You’re not forced to micromanage the population and juggle citizens between systems. You can obtain bonuses provided by the support of the given population much faster. A few races provides a welcomed balance between management and bonuses. Your dominating race will still be the most important in the empire, but you will also be able to use the bonuses provided by other races (for example better production on the given type of planet). You will often be able to get bonuses for many representatives. On the other hand – ideological unease can be problematic during elections and can negatively impact happiness, although it’s possible to choose races that have similar ideologies. Many races ensure diverse population. It’s characterized by a myriad of bonuses. Additionally, if you manage to assimilate them, their race traits are included in the characteristics of your empire. The problem is that with such diverse society, it will be very hard to maintain the chosen party as the ruling one. It will also be difficult to keep track of which heroes should go to which systems. It’s not an easy choice because there are always pros and cons here. It all depends on the faction you choose as the first one and the playstyle you’d prefer. As Horatio, for example, you will look forward to assimilating more races to be able to use their genes. These races may become useless then. As Cravers you need other races for slaves. The senate, choosing the part and selecting the form of government in the empire are all novelties, compared to the prequel. However, this system isn’t of the foremost importance (albeit it is important). You will only need to come here if you want to see certain laws introduced or when the majority supports an ideology, but the ruling party is of a different ideology. Consist of representatives (1) (the units of the population in favor of the given party) and senators, i.e. the members of the leading party (2). The heroes that support the given ideology are party leaders. Every government has a certain number of senators that influences the number of Leading Parties. A dictatorship allows only one party; a democracy has three senators. Underneath the symbol of the current government you cab see the bonuses provided by it (3). Each form of government provides different bonuses and abilities of influencing your population during elections. 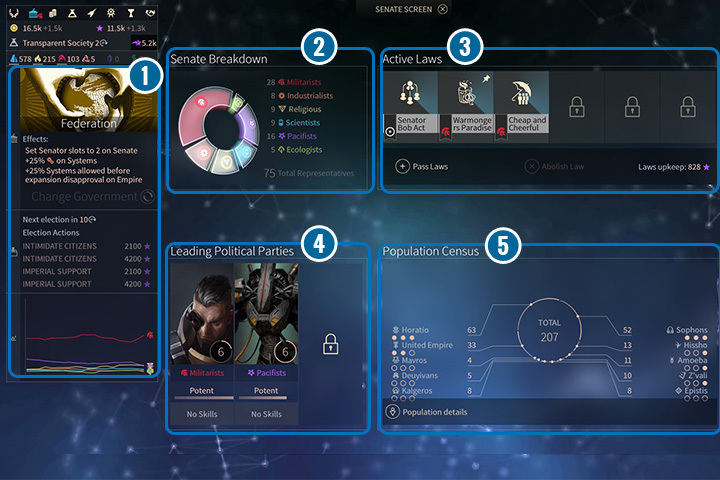 Access to new forms of government is gained after unlocking the Xeno Anthropology technology, available in the 3rd stage of Empire Development. If you manage to do that, you will be able to select, in the senate screen, Change Government (4). Changing the government usually requires 50 Happiness points for the whole empire as well as an amount of influence. A period of anarchy will begin, during which all laws will bu suspended, which is the perfect opportunity for unhappy factions to mutiny. Also remember, that populations is systems get a happiness bonus if the party they’re in favor of is the leading one (and a happiness penalty otherwise). Democracy. Up to three parties are allowed. One more law can be introduced, and and additional happiness per citizen is awarded. A good solution for a vast empire with many citizens. Thanks to the multiplicity of parties, you’re able to be more flexible and to introduce different combinations of Laws. Republic. It’s a bipartisan system. Laws give better bonuses – most of the time, around 5 percentage points more than in other cases (15% instead of 10%). On top of that, you can manipulate the outcome of elections, to some degree, by spending Dust. Federation. Similarly, only two parties in the government. You can have two systems more before receiving a penalty to happiness. You can spend influence to manipulate the outcome of elections. Dictatorship. A single party in the government. This allows it to gain experience quicker. The systems are much quicker to mutiny, though – it’s enough for happiness to drop below 30% instead of the regular 10%. Only to Laws allowed. You can upgrade a system so that your government is propagated there. 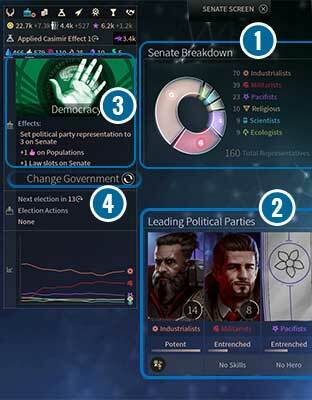 There are six ideologies and as many parties in the game. If you have a hero that favors the given ideology, they will become the face of this party. Every subsequent hero from the same party will contest with the current leader. The more often you side with the given party, the faster it’s “experience bar” will fill up. Thanks to that, you can introduce more meaningful Laws. Additionally, every hero gains in time access to abilities that are only activated if he’s a senator (i.e. when the party he’s in is in the government). These abilities should be developed, but only in the case of those heroes, who take part in politics. These are additional bonuses for the whole empire. Every party has a set of laws, which are automatically activated as they become the leading party (the small symbol of a pin on the party’s emblem). If there are more parties in the government, the one that has reaped the most votes is the one that introduces its laws. These laws cost nothing, but cannot be canceled. Depending on the government and scientific progress, you may be able to introduce additional laws. Just click the Pass Laws button. Before you will appear all the laws that can currently be introduced. Some laws are related to specific ideologies and they cost an amount of influence. However, these are usually more powerful and yield better bonuses. In order to unlock these better laws, the given party must be elected often. With every election won you should get access to better laws. The laws that have a white icon instead of the ideology emblem are accessible for everyone. Every system participates in the election – the number of votes translates to the number of representatives. When you get the results, you can see which parties will now constitute the government (image on the left). The elections are held every 20 turns. A couple of turns prior, you will get a preliminary survey of support in your systems. You can also investigate every single system. Some types of governments allow improving your party’s standing before the elections, or weakening the opposition. Bear in mind that those actions don’t always have to yield the desired outcome. Don’t be surprised if a party that supposedly was to win will actually lose with a technically less popular rival – although they will still make it into the senate. Losing the elections doesn’t necessarily mean things will go to hell form thence on, or that the game has ended. The only consequence is that you won’t be able to use the laws that you used before, and that the leader of the party will no longer support you with their bonuses. Developing the technology is of utmost importance. Without this, you will never be able to dominate the galaxy. New inventions will reinforce your ships – making them much more powerful with new modules. Your planets will have better income and the citizens will be happier, regardless of conditions. Some technologies will allow erecting new buildings and structures; others will allow unique improvements and wonders. Sometimes their effects are immediate – you just need to develop them. When you open the technology tree, you will see it’s divided into four categories. 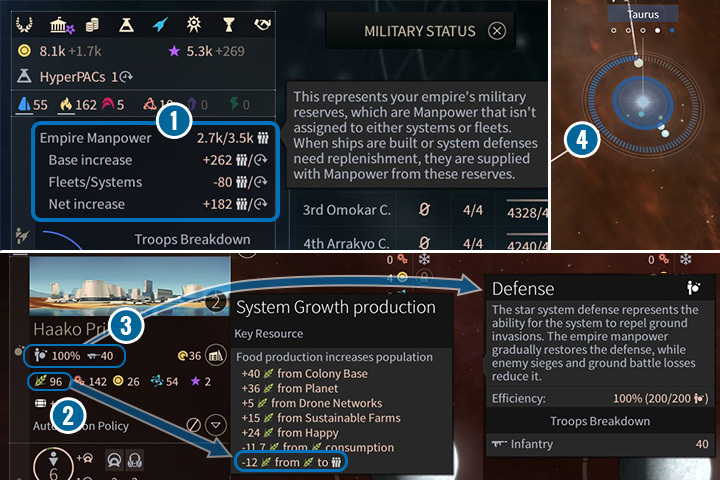 A sum of science points coming from your whole empire counts for technological development – planets, systems, events and other bonuses all contribute to this. Remember that you need to unlock technologies closer to the center if you want to discover more advanced things that await at the rims of this diagram. What do the specific categories mean? At the top, there’s everything you need about the Military, that is new weapon modules, structures and tactics, as well as ground units. 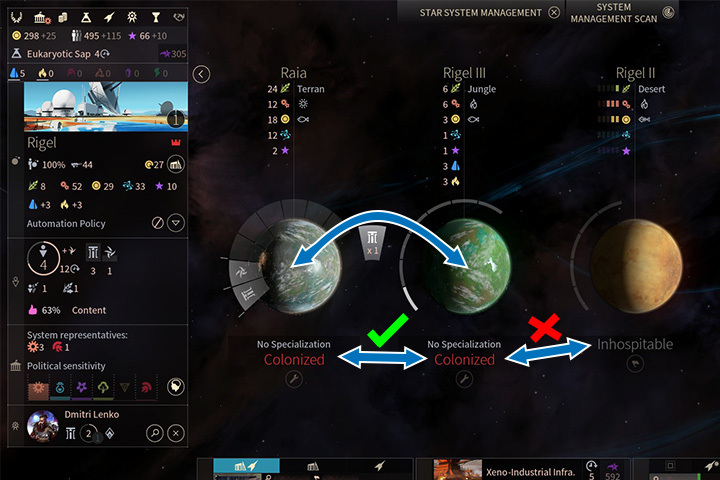 Note that the entries on the left have new modules that don’t require strategic resources. The downside is that these are inferior to those that do require such resources, which are on the right. Economy and Trading are on the right. Here are trade and industry projects, as well as improvements in Dust output in systems. You unlock here access to the Marketplace and the ability to colonize some of the inhabitable planets. Each new project here allows developing your systems further, as well as to extract new resources. On the bottom, we have Science and Exploration. As the name suggests, you can obtain new ways of traveling and of discovering the mysteries of the anomalies (curiosity). Here also are the technologies that allow terraforming and adding more population slots on planets. The ones on the right, are Empire Development tech. System improvements concerning the food output and the levels of happiness and influence are all here. You can unlock new diplomatic actions and forms of government. Some of the technologies will ensure new projects of better and bigger ships, which can be useful if you’re planning to expand the fleet. 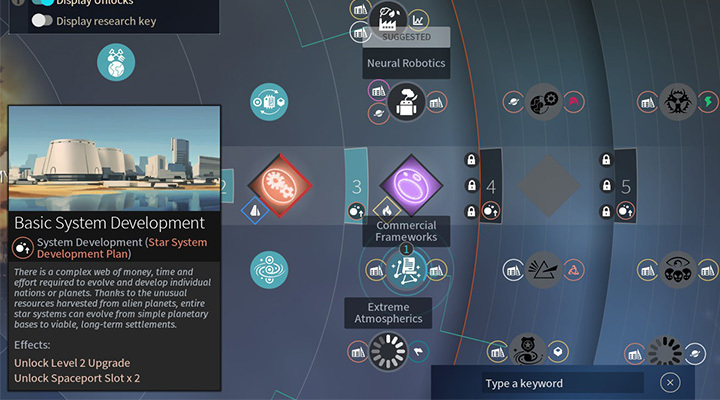 There are three tier 3 technologies missing in order to unlock tier 4 Economy and Trading. Unlocking subsequent “rings” (Stages). Every new stage requires a few technologies from the latest stage. The number of lock icons indicates how many technologies you need to be able to research the next stage. The Stages themselves don’t necessarily have to be developed, but they often yield some interesting inventions. Besides, every stage usually offers some additional challenges (such as “develop 40 technologies”). This may yield some awards and adds to your score. Some stages are more critical than others: Economy and Trading will unlock system improvements at some point. That’s not only very profitable, but allows interplanetary migration. Both of these are extremely useful. In the Empire Development, on the other hand, add new slots for Laws in the government. In subsequent stages of Exploration and Science, you will gain access to new modules, hence improving your military. Trading Companies can be created only after you develop one of the technologies from Economy and Trade tree. Thanks to them you can increase your income by getting more Dust and Science. Besides that you can also trade and get more luxury resources. If you unlock a technology that allows you to sign a trading contract then you can also use subsidiaries of Trading Companies that belong to other civilizations if you have an established connection with them. After placing your first Trading Company, with time, you will unlock another one. You can speed up this process if your active company gives you good profit. This encourages in-game characters to invest in a new one. You can have up to 5 Trading Companies. How do Trading Companies work? After building your first company you can quickly build a new one. They consist of a headquarter and a subsidiary. First, you need to build a headquarter in one of your systems and only after that you can access the option that allows you to build subsidiaries. Remember that systems must be connected by Star Lanes or Wormholes. You can’t have a connection with a system that is outside of a constellation – the ones that can only be accessed by using free movement. When you build a headquarter in your best system you usually have high Industry and thanks to that the process of building said headquarter is very short. Building a subsidiary can take a little bit more so you should speed up the process by spending some Dust. Each of the Trading Companies’ headquarters will use all available subsidiaries. If you build a few headquarters and subsidiaries you create a web of trade routes which will increase your income. When you sign a trading contract with other civilization you get the access to their subsidiaries and vice versa. Thanks to that you can have access to otherwise unobtainable resources – it is because your Trading Company will start producing such resource. The Trade map allows for a better planning for your Trading Company. How a Trading Company earns Dust? The income is based on a few factors: the distance from a headquarter to a subsidiary, number of systems through which a trade route goes, how rich are the systems in the area around the route, number of recipients (the connections between a headquarter and all available subsidiaries), amount of structures that modify an income from trade and production (FIDSI and resources) in a headquarter and a subsidiary. Thanks to that you can receive a lot of income. The only direct way is to built subsidiaries and buy new trade ships to your Trading Company fleets. But this is only a statistical value and you won’t see those ships moving between systems. However, they increase the percentage of income from your companies. 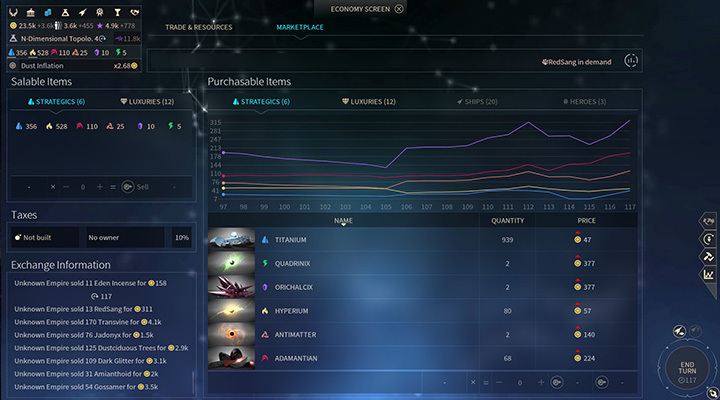 You can buy trade ships that increase your income of Dust and Science or increase the amount of luxury resources. The length of a trade route is the most basic determinant of its profitability. An ideal situation is when a headquarter and a subsidiary are in two opposite ends of a galaxy. Extending a route artificially allows you to generate more profit. It is recommended to establish a headquarter in the richest system (the one with the biggest population and Dust production) that has deposits of luxury resources. Their number, expressed as a percentage, is added to Trading Company profits. After a few upgrades a production of resources can be much bigger than in two planets combined. The excess can be used, e.g. for upgrades from System Development or to trade in the Marketplace to get even more profit. When you get the access to Wormholes, usually, you get new possibilities for making new trade routes. You can sell some of your subsidiaries and build new ones in farther parts of your empire. When you are planning your Trading Company you must watch out for uninhabited and neutral systems. The first ones can be taken overtime by someone which interrupts your route. A neutral system allows you to keep your route but they are places that generate pirate fleets. They, in turn, have tendencies to block systems and therefore they stop a trade route. This means that you won’t get any profits from it. It is worth to build your subsidiaries in safe parts of empire, away from border systems. Even if it means that you will get less profit. In the systems that are farther from you, you should build subsidiaries. By doing that, when you lose that system, you only have to create a new subsidiary. Losing a headquarter is a different story – when this happens you lose Trade Company and all investments connected with fleet development. Moving a subsidiary is much less expensive than creating a company from scratch, especially if you have more headquarters and subsidiaries. This means that you can safely test which systems are the best recipients or place them in systems where you can increase those luxury resources that are the most important to you at that moment. All players have influence on prices and amount of resources. You get the access to the Marketplace when you develop a technology from the second ring in Economy and Trade (the second upgrade allows you to buy ships and heroes). Enter the Economy Screen and select the Marketplace tab. On your left there are two windows. The one above informs you about your strategic and luxury resources and allows you to sell a certain amount. Below, you can see the recent transactions. Another part of the screen shows you a graph with prices which is divided into four tabs. In the first two you can learn about prices and buy resources. Remember that you can trade only those resources that you mine or were acquired, e.g. as a loot for scanning a planet. Purchase and sale influences prices in the entire galaxy. The number of resources that you can buy is limited but you can always sell any number of resources from your warehouses. It is not worth to buy all of the available quantity of a given resource. Instead, you should buy up to 2/3 of what is available at that moment. The closer you are to a buyout of all available quantity the higher the prices are. You can pay much more for the last units of a resource than they are worth. Besides that you can often receive random information about sudden decrease or increase in a price of a particular resource. In the other two tabs you can get ships from other neutral factions. You can use them to strengthen your fleet or to use them as a corsairs (this option becomes available after developing a certain technology from Military ring). The ships will appear in a hangar in your capital. You can command them in the same way as the ships constructed in a shipyard. However, you can’t upgrade them which means that they are better as an addition to your defense forces during critical situations. The last tab takes you to heroes screen. Here, you can get new subordinates by paying a certain amount of Dust. You can use this option from time to time if you want a certain type of a hero or you have a lot of Dust. Heroes are unique agents that can greatly help your empire. Diplomacy can quickly become an important element that allows you to be in good relations with other civilizations. If you want to have more options then you should develop a few technologies from Empire Development tree. The option for negotiations becomes available when you meet a fleet or fly to a system that belongs to other civilization. Your probes can also be used for that. Usually, other civilizations don’t like when you colonize a system that is close to their borders or when you establish an outpost in their system. If other civilization see you as a weaker one you will often receive a scornful information or demands. If you don’t fulfill them it doesn’t necessary mean that a war is nigh, even if they usually say that, but many of those civilizations will tell you about their attitude towards you. If you have good relations with other civilizations you can receive a message about a trade or scientific cooperation. If you make such offer it will, most of the times, be accepted. If you feel powerful or you are in a good relationship you can demand or ask them for something. 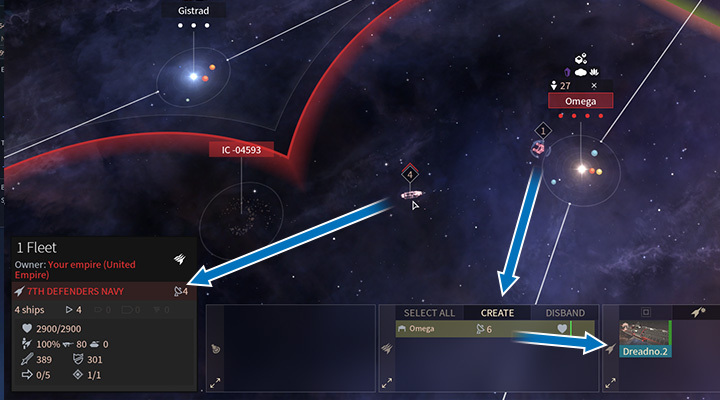 In the Diplomacy Screen you can see your current status and level of relationship (the blue or red bar). You can also click on another civilization to see their relations with you. This can be useful if you are looking for a friend or foe. The Negotiation Screen opens every time when you click on a symbol or name of a system of a given empire. In this screen you can make demands. 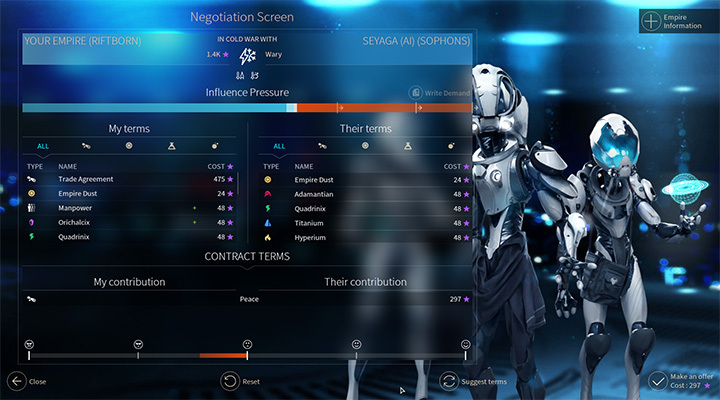 The negotiation bar in the upper part of the screen informs you about what you can demand. Turning down a demand may result in breaking all deals and that empire may declare a war on your empire. After writing a demand you must wait a moment to receive an answer from the other civilization. In the middle you can choose what you want to offer or what are your expectations from the other side. A green plus next to each position, the lower bar shows you what your enemy thinks about your current proposal. Sometimes you only have to offer more Dust or resources, although sometimes there may be a situation in which your enemy, despite having good relations with you and a generous proposal, won’t agree to your offer. If you are not sure what you can offer click on Suggest terms button – computer will automatically choose a tempting offer for the other side. Cold War. In default, this relation status is active during each new relation and after finishing a war when a peace treaty’s time has ended. It is a peculiar relation status because it is, to some degree, a peace and a war with other empire both at the same. You can attack your enemy in your or in a neutral area. You can travel in enemy’s systems but you can’t conquer them. An exception to that is when an enemy’s system is in your sphere of influence. Peace. This is a much better status than a Cold War. You can’t attack enemy’s fleets nor systems in any place and under any circumstances. It is used to boost your relations with a given empire. Alliance. It is used not only for having better relations with other civilizations but also to protect your territory. This treaty can cause problems to those that want to declare a war on your empire. On the other hand you can take a part in a war that is not useful to you. Opening/closing borders. Despite Peace or Cold War your space is available for everyone. However, thanks to this treaty you can deny other civilization to move freely in your territory, although this will worsen your relation, trade and science. Signing a trade contract. You open your borders to trade routes that belong to your partner and you allow them to use your subsidiaries for their Trade Company. You also receive the same privileges. If one of the sides doesn’t have a Trade Company then this treaty serves only to boost your relations with others. Signing a scientific contract. 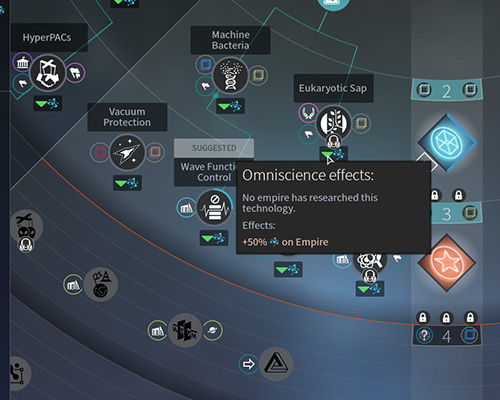 A scientific cooperation between your and other empires can result in a new technology and can increase Science points per turn. Exchanging maps. You can offer an exchange of those systems that you already visited or buy exploration achievements from other civilization. Vision sharing. After signing this treaty you can see what the fleets and the systems that belongs to your partner see. Relations with minor civilizations are much easier to handle than with the major ones. First, you must unlock the technologies from the basic stage of Empire Development. Each galaxy has a lot of random factions. They have only one planet and its population is based on the dominating race of a given faction. This space is neutral but it also creates pirate fleets that attack everyone. Seizing such system near your borders should be one of your main goals. If you want to negotiate you should accumulate a lot of Influence points. The better are your relations with a minor faction, the more resource and Manpower they offer you. Assimilating a faction offers you, besides the control over a system and population, a special assimilation attribute that has an impact on your entire empire. A system can be assimilated in two diplomatic ways or you can simply declare a war and proceed with an invasion. Start Negotiations. Costs a small amount of Influence points. Enables new diplomatic actions. Praise. Changes the approval points by a fixed value for a few turns. You can use this action again if you want to increase your relationship points per turn (although its duration time is the same). Each subsequent action costs a lot more points. However, the cost is lowered overtime. It is a useful function if you want to quickly establish a good relationship with a given faction. Assist. When you fill about 50-75% of the relationship bar you receive a free assist action. You get a quest which allows you to assimilate a faction without any additional costs. Assimilate. Peacefully overtaking a system and adding it to your empire. The relationship bar for a minor faction must be completely full, you must have a lot of Influence points (depending on the size of your empire and the assimilated faction) and none of the other civilizations can be their ally. Declare war. Your relations go down to zero but you receive an option to conquer them by force and then to assimilate. Selective migration. If you have good relations and you don’t have a lot of a particular luxury resource you can encourage a citizen of a system to go to the nearest system that belongs to you. Useful, if you want to increase your population or if you want someone from a particular race. Funds for development. By spending a certain amount of luxury resources you can increase planet’s productivity and you get more profits from relationship. Also you receive, for a certain amount of time, their special trait. The income of Dust, Science points and Manpower are doubled. Sometimes it is better to have such faction, especially in the beginning of the game, because your profits from a relationship are bigger than from an assimilated system. A request for foreign squads. When you use this action (pay a certain amount of luxury resources and be in a good relations with a faction) you receive a group of ships from an alien civilization. You will most often be looking at the galaxy and the systems. At the very top (1) you choose between normal and economy view, which will come in handy later. In the upper left corner (2) there is a small status window, that keeps you up to date about the state of the treasury and Dust income every turn, as well as the status of Influence, Manpower points and their income. You can also see which technology is currently being developed and the state of strategic resources in stock. At the top of this panel, there are shortcuts to the various screens described below. If you hover over the name of a system with the cursor, in the lower left corner you will see a brief summary (3) of that system, its FIDSI revenue, population status, etc. (works similarly if you hover the cursor over a fleet). When you select a fleet (or ships in a hangar) you will see its status at the bottom (4) and all possible actions you may take, such as upgrading or assigning a hero. In the lower right corner (5) there is the turn end button (and the turn number). 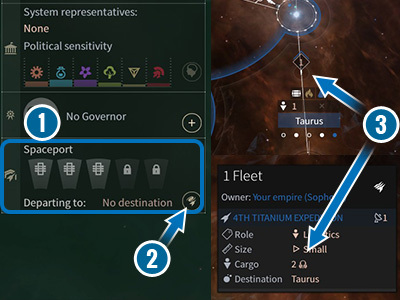 Above it, there is a button which selects fleets that do not have any orders, a button which continues the movement of fleets (the ones which have longer routes planned out) and the options button. The right side of the screen also contains icons for notifications and events. 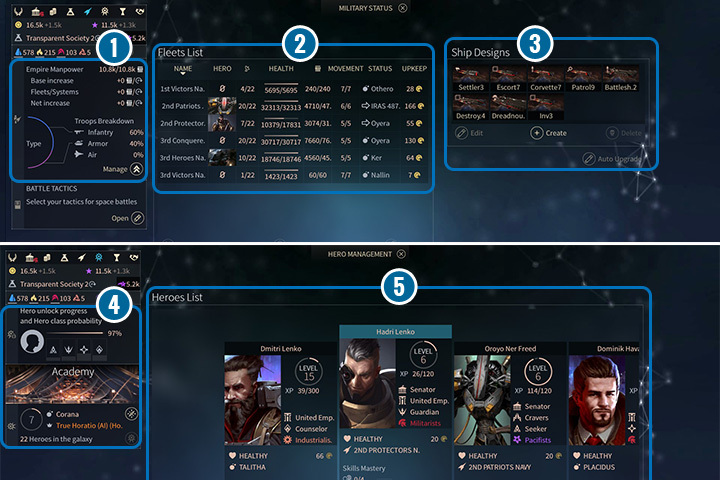 In the game you will find many useful tabs/screens, which will help you to effectively manage your galactic empire. This will make it easier for you to find the information you need, such as the support for an ideology, or to show which system generates the most revenue and where you need to make some corrections. You will be able to check the progress you have made regarding a specific victory condition or what technology you need for the next stage of development. Below you will find the descriptions of each of these aids. On this screen you will find basic information about your empire. (1) This panel is a general description of your faction. If you forget what unique qualities or abilities your people have, just look here. On this list you will also find the features that you have acquired by assimilating minor factions. (2) Empire Approval. This is the average value of approval of all systems under your control. If a system has very low approval, an icon will appear here to measure the time until the uprising. The bar below shows how many systems you can colonize before you get penalized for over-colonization. (3) Victory conditions and the evaluation of your efforts. Here you will find various statistics e.g. how many technologies you have researched or how many planets you control, as well as your position in a given field among other civilizations. The more filled-in squares, the closer you are to a given type of victory. Systems. In this screen you can manage your planets. 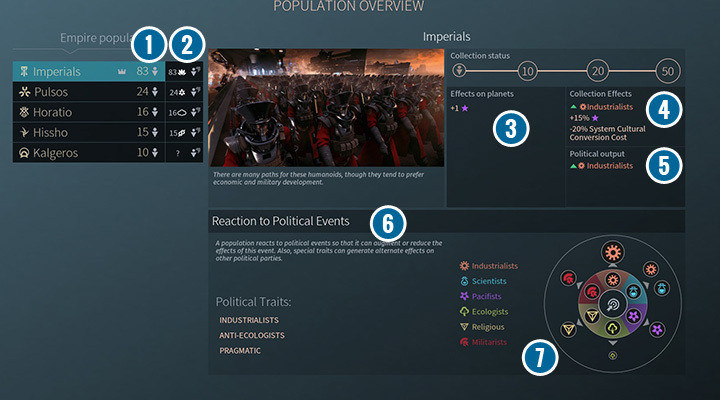 You can assign heroes, check the placement of your population on planets (you only have to click on a dot next to system’s name), select new construction project, change the automatic policy of ruling a colony, sort systems according to their income or Approval and check which population’s representative have appeared. (1) This window shows your government type, its influence on the empire or other aspects. Once you discover the correct technology, you can change the government type to another with the Change Government button. Below, you will see the time left until the next election and options you can use to affect them. At the bottom there is a chart of support for all of the individual ideologies. (2) The pie chart shows the support for the representatives of a given party and their total number in the senate. (3) Active laws. One of the laws of the leading party is always active. You can, however, introduce new laws, from the parties which are a part of the Leading Political Parties. You will also see what the total Influence cost per turn is. Independent laws do not use Influence, where some party specific laws can often have an extremely large cost. (4) Parties, which have won the election and gained the most support become members of the Leading Political Parties. However, there is only one main party and government leader. This is shown on the Senate Screen icon. Underneath it there is a small symbol of the party which is leading the government (number 4 with the arrow in the upper left corner; under the Senate icon there is also a small red icon of the Militarists). 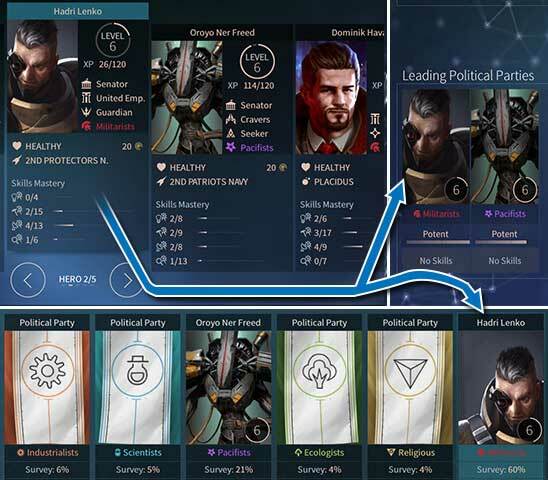 Under each party portrait you will see their level bar (they gain levels quicker, if they are often elected; unlocks more advanced laws) and leader skills (if the hero has any). (5) Population Census. Here you will see the composition of the population in your empire (white dots indicate how many unlocked Collection levels of a given population there are). 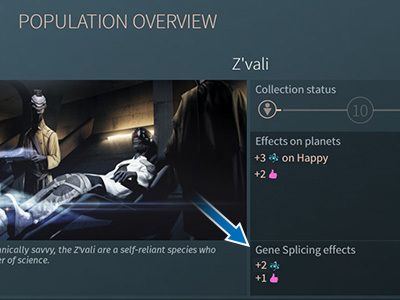 After clicking, you will go through a more detailed description of all the races in your empire. 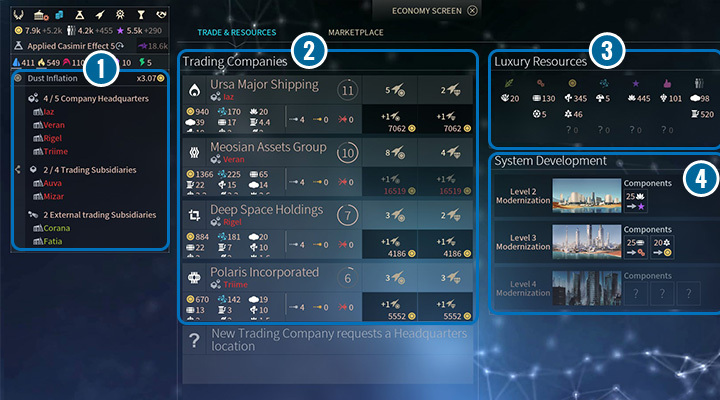 Trade, Luxury Resources and System Development screen. 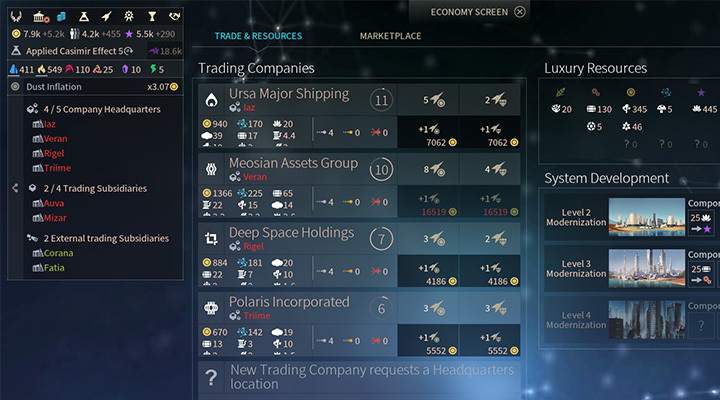 On this screen you have three additional tabs: Trade & Resources, Systems and Marketplace. You will most often use the first two, and you will find a lot of information about your profits and revenues on planets and your current status here. The Marketplace, has deliberately not been described here, because you will only unlock it later on and you will not be using it very often. It has been described in the chapter on trade. (1) You can find the current Dust inflation status on the side bar (how much more you need to spend than something is actually worth), as well as the list of Company Headquarters and their trading Subsidiaries. (2) List of Trading Companies in your empire together with details. How much each one earns, how many trade routes it contains, and the number of ships and the effectiveness of that company. You can spend Dust in order to improve these last two factors. Below, there is a bar that, when completed, will unlock another company. You will learn more about trading from the next chapters. (3) The list of luxury resources you have in your warehouses. Each is assigned to a specific resource/effect icon, that it effects during System Development. (4) Here you select what luxury resources you want to assign to System Development. Choose the resources you have a lot of, you can acquire easily or you want the effect of. You cannot undo the decision once it has been made! From now you need 25 units of the selected material to build this object. Here you can select the technologies, that you want your researchers to develop. Technologies, which are closer to the centre are the initial research that you can unlock. To get better improvements, modules, etc. You need to develop as many technologies in the current ring as to be able to unlock the next one (the amount of required technology varies with each level). This is the case for each of the four areas. (1) In the side panel you can see how many Science points you earn per turn (it is counted from the whole empire and all possible bonuses). You also see which technologies you have chosen to develop and how much time it will take. (2) The search tool is a very useful feature. You can enter a word or a part of one here (if you are not sure what you are looking for), e.g. colonization. Then, all of the technologies that contain this word will be highlighted. 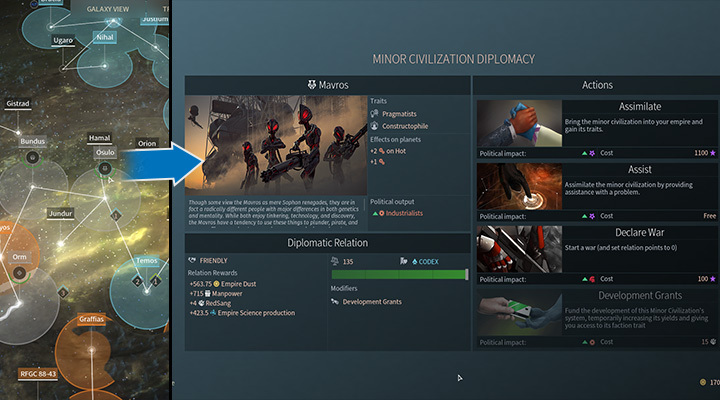 Here you can find information about Military Status, Hero Management, Quest and Events and Diplomacy Screens. 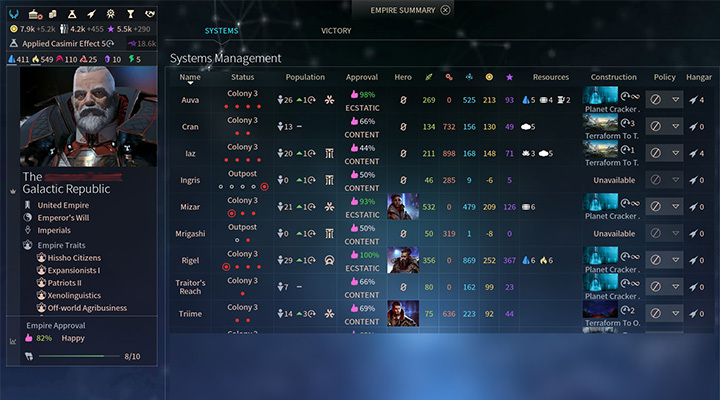 The Military Status screen shows your manpower reserves in the side panel (1), their growth per turn, fleet/systems consumption, and how much “net” manpower you gain. Below you see the composition of your ground troops in the event of an invasion or defence. You can click on manage to change these values. For more information, see the chapter on land combat. To the side you can see a list of all active fleets (2).You can click to see their composition, or double-click to move to their location. On the right (3) you can see the current designs of your ships that are in use or are ready to be produced. 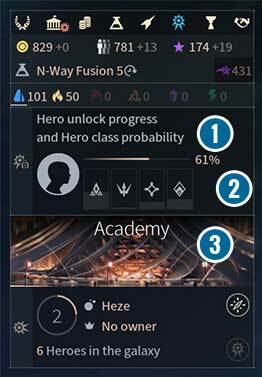 The next screen, Hero Management, gives you access to the following information. In the sidebar (4) you can see the progress of the training/capturing of the next character. Under the progress bar, there are four bars that inform you about the chance of acquiring one of the four available classes. Your style of play affects who you get the chance to get. You can hover over with your cursor, to get detailed information. The greater part of this screen is made up of the list of heroes (5) who are at your empire’s service. This screen is a collection of information about your current, completed, and failed quests (1). A large part of this screen is made up of a detailed list of quests and events (2). You can also use the pushpin button to have a short notification displayed on the main screen in the upper right corner. The Diplomacy Status screen (3) shows your relationships with other civilizations in an easily accessible way. From this screen you can go to the negotiation window, but also swap position to another civilization, in order to see their relationship with the rest of the galaxy. Under the portrait of your character, there are also symbols that show the current status of relations with a given race. Choosing your race for the first playthrough in Endless Space is not something obvious. There are more differences between the factions than stat bonuses or the appearance of citizens and spaceships – some of them have completely different gameplay philosophy or things like preferred planetary environments. Some races feature a classic development path, but all of them share the need to expand their territory, develop technologies and, in most cases, increase their population. Below, you’ll find a number of hints and useful information concerning your race choice for your first and subsequent playthroughs (especially if you’ve never played similar games before), as well as some explanations concerning the elements neglected by the game tutorial and manual. 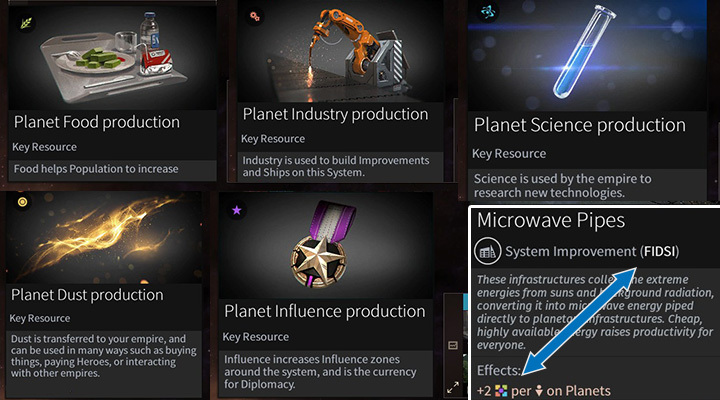 Influence points can be used in many ways, for example, to speed up production or research. Humans a.k.a. the United Empire. It’s one of the more conventional races in the game, although not without some exceptions. Their special trait is the ability to spend Influence points, normally used on things like border expansion, development of colonies, upholding of laws and acts in your empire, or diplomacy. The EU is able to use Influence to speed up upgrade and ship production in star systems, as well as speed up technological research. Additionally, they can also spend Influence points in trade, which significantly helps during the game and enables you to use Influence as an alternative to Dust. The representatives of this race have a small bonus to Influence generation, and some of the Industry points you spend will also generate Influence, enabling you to quickly amass a large amount of the latter. The faction possesses a bonus to peaceful conquest, e.g. through culture, which also requires Influence points. A large pool of Influence will grant you a significant flexibility and advantage over other civilizations. The colonization process is conventional, requiring you to send a colonization ship to a star system with suitable planets. Their ships are equipped with more weapons modules than most other factions, making it easier to build a strong fleet. Each race is given a set of plot-related quests. Complete those quests early on, and you’ll be able to choose an additional hero from among the 3 available classes, which certainly won’t hurt your chances of success. The Sophons. They are a race of scientists, focusing around various bonuses to research and exploration. Their representatives have an increased science bonus when inhabiting cold worlds. They also gain a science bonus when they research a technology before other factions. They also have the knowledge of the technological progress of other factions. This will enable you to quickly gain the upper hand when it comes to technology, which is an important element to any victory condition. What’s more, it will enable you to catch up in aspects in which you may be lacking. 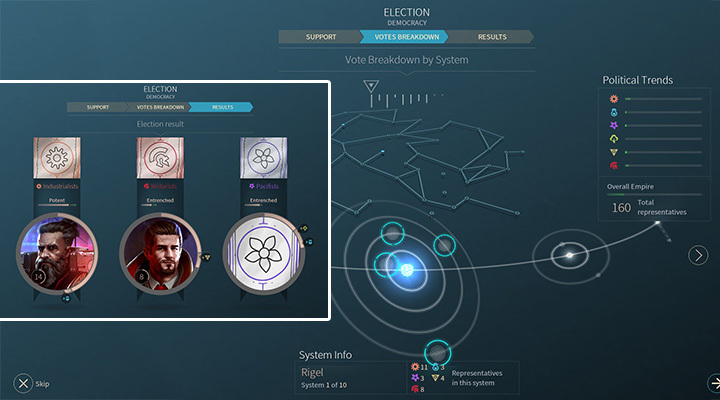 Their ships are somewhat weaker, but if the Scientific party remains in power for a longer period of time (you begin the game with their representative in the government), you can introduce a highest-tier law, which adds 50% to the power of your attack modules. The exploration is made easier by the special ability to detect nearby star systems. Colonization takes place the same way it does with human civilization, so you should focus on systems close to your capital or nearby already controlled ones. For second and later playthroughs: The Lumeri, The Horatio, The Cravers. The Lumeri. They are a race of traders, whose power is based on Dust. They live and develop exactly as the two previous races, except their focus lies on acquisition and usage of Dust. They have a large bonus to Approval in each star system, and their representatives generate additional Dust. The basic difference is the colonization method. They do not need nor have colonization vessels. If you need to acquire a specific system, and have the technology to inhabit that specific world, all you need to do is buy the planet. An outpost will appear automatically and it will develop as all other such facilities. You can also sell the outpost belonging to another faction, earning additional funds. 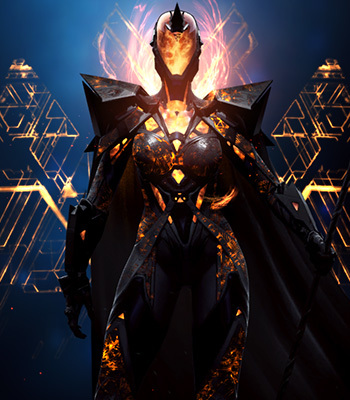 The Lumeri can quickly expand their empire, claiming the best available systems. Additionally, their trading companies can operate on territories belonging to other empires, even those that are not friendly. Many of their technologies and system upgrades provide bonus to Dust production. The last thing you need to know about The Lumeri is the fact that they can also use Dust when interacting with minor factions. Relations are established by spending Influence points, but increased by bribing factions with Dust. This way you can much faster assimilate such factions or establish alliances with them. 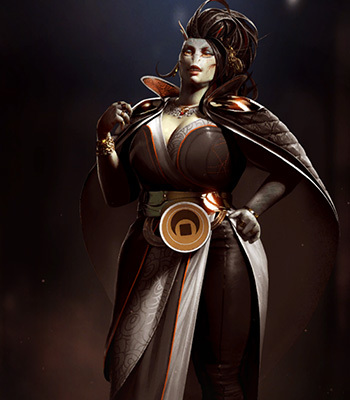 The Lumeri love for moneymaking is a perfect match for their usage of the trading place and buying production on star systems. A great faction for people who like to use money to deal with problems and prefer peaceful gameplay. In time, The Horatio can acquire the bonuses of other factions thanks to Gene Splicing. The Horatio. Their gameplay is similar to the previous races, and their quests and technologies tend to favor either Food production or population growth. Their representatives provide a bonus to Food production and Approval on hot worlds. Additionally, they have an additional citizen on each planet. They also have a certain, very unique trait. They can copy the genes of other races living in their empire, allowing The Horation to gain a partial or even enhanced bonus of a given race. That’s why it will be important for you to quickly acquire representatives of other races, and either dispose of them as soon as you get their racial bonus or increase the population to the required number. If you neglect this, the other races will soon get ahead of you in other aspects. The Horatio ships are more costly to build, but they are flexible when it comes to available modules, making it easy to mould the ships according to your vision. It’s a great race for longer playthroughs and with a galaxy densely populated by minor factions. The Cravers. As the name suggests, they are a greedy race, feeding on other species. They gain much more FIDSI resources per citizen than other factions. This allows them to quickly expand and develop, as long as they have slaves (The Cravers must share a planet with other races). This leads to loss of the planet’s value with time. It’s good to move to another star system from time to time, to assure maximum income. You can also consume a representative of another race to increase Approval in the system. 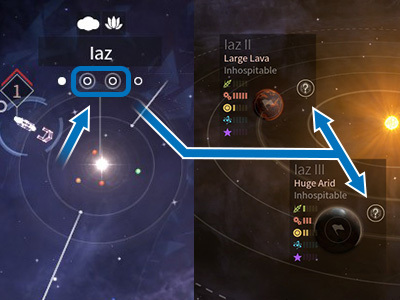 The Cravers can have two additional citizens on each planet, and their fleets can have two more command points from the start. All those bonuses, however, are overshadowed by the Eternal War trait, i.g. if the militarists rule the empire, you automatically enter Cold War state with all other empires (unless you’ve already declared war on them). When playing as The Cravers prepare for aggressive expansion and wars. You’ll need many representatives of other races to keep profiting from your own racial bonuses. It’s very hard to play this faction in a peaceful way, all the more so due to it’s favorite ideology being militarism. Advanced races: The Unfallen, The Vodyani, The Riftborn. The Unfallen influence sphere can encompass only neighboring systems. The Unfallen. A tricky race, requiring you to spread vines across neighboring systems before you can colonize them. First, however, you’ll need to send special units that will help in taking over of the star system. Despite the wide influence zone, the only systems that count are those you’ve colonized (you can also control special points, such as nebulas or asteroid belts, using the same method). As a race, The Unfallen have a large bonus to Food production, and can have access to the representatives of the Guardians, a race with which they have formed a kind of symbiosis. The Unfallen can sacrifice members of their own race to increase Approval in the system. 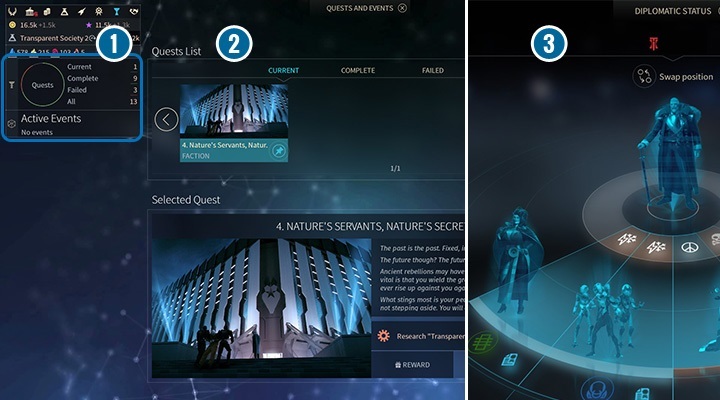 The can gain quick access to terraforming projects if you complete their story quests. The favor peaceful existence and friendly relations with other factions, and gain bonuses, also to Approval, when enjoying peace. You’ll need to make the most of the area around your capital, remembering that only systems inside your sphere of influence can be put under your control. Even minor factions need to be “linked” to your home system before they can be assimilated. That’s why their preferred gameplay should be peaceful, focused on fulfilling victory conditions other than military. The Vodyani. In theory a very strong race, assuming you can lead them properly. Their representatives gain +4 to Dust, Science, Food, and Industry. One citizen of this faction works on all the planets you control in a system. They automatically colonize all the planets in the system once they connect their mother ship, an Ark, to the system. Their natural growth, however, is much smaller than in other races, and they need an additional resource – The Essence. To acquire it, you need to send units equipped with special modules to planets controlled by neutral civilizations. This enables you to collect large amounts of the special resource and build Arks, the mother ships on which your citizens live. It’s the only place they can inhabit. 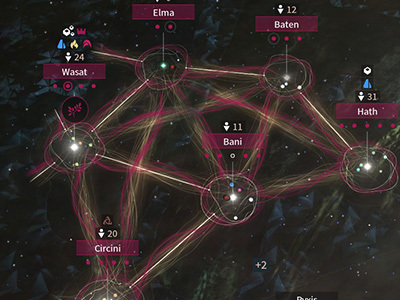 Arks can be connected to star systems, enabling you to profit from them. An Ark may leave a system in any moment a move to another one. You cannot assimilate nor acquire any other race to serve you. Due to their nomadic lifestyle The Vodyani should travel between various systems, steal Essence, and conquer other races. Arks are equally capable as warships, being heavily armed and having a lot of hit points. The development of your empire can be tricky, though, especially when there’s no other civilization nearby. Some singularities can strenghten your star systems or impede production and resource acquisition in enemy-controlled systems. The Riftborn. It’s a race that came from another dimension, making their approach to many things rather unique. They can colonize and like to inhabit environmental conditions that scare away all the other factions. The most hostile planets, such as barren or cold ones, are their favorites; they also have a bonus to Approval on barren worlds. Even their terraforming technology works the other around and subsequent research will allow them to colonize worlds the rest of the universe thinks to be the most welcoming (such as coral, oceanic, jungle, etc.). Their representatives have a +5 bonus to Dust, Science, and Production, making them owners of the strongest racial benefits. The most important thing is the population growth, vastly different than among other civilizations. You see, The Riftborn do not need Food – they assemble their representatives the same way they make ships or planetary upgrades. In the beginning it’s hard to increase the population, but it becomes easier later on thanks to population control. You’ll also have to produce manpower. The same goes for colonization. While you do send a colonization ship, the outpost will be the one producing new citizens, making the distance to your nearest planet not that important. 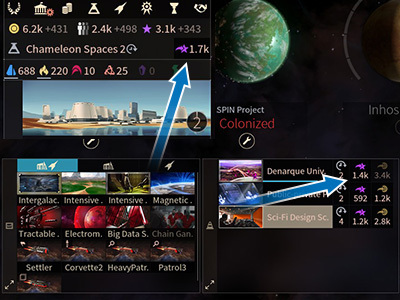 You can support the development of the new colony by spending the two basic strategic resources. Their last unique trait is the ability to create singularities. When playing as the Riftborn it is important to form alliances with minor factions, not assimilate them. This will provide you with a significant bonus to manpower, exempting you from the need to produce them yourself, and sometimes offering better results altogether. It’s not easy to develop this race, but you may be able to achieve better results than with other factions. I’d suggest playing them peacefully, focusing on slow expansion. United Empire is a very versatile race that can go through anything. Their strength is based on Influence points that can be used in many ways. They focus on expansion through colonization and cultural dominance. Their strong and diverse ships are good for military conquest. A great choice if you are starting your adventure with 4x strategies or Endless Space series. They start a game with Industrialists faction as the leading party. Special ability. Additional Influence points in quantity of 0,1 per each Industry point used. In other words, when you build or produce something you receive a small amount of Influence points. Besides that Influence points can be used in the Marketplace so you don’t have to use Dust as the currency. You can also use the buyout option for a faster construction of upgrades or ships in a system. Influence points are also spent on developing technologies immediately. Next to the technology that is currently under development you can see the cost of Influence points. If you have that amount you can speed up the researching process. Because of that you can catch up in those fields that you are currently lacking. Faction’s traits. They start a game with an additional Hissho population. Their limit of planets, when their expansion is too big, is lower. Humans receive +25% to Manpower in empire. Race’s traits. Humans have a bonus +1 to Influence points per member of the race. Their favorite political party are the Industrialists and the least liked are the Ecologists. The second stage is the bonus of +15% to Influence points in a system with Humans population. The last bonus is -20% to costs when culturally converting a system that belongs to other faction. Way of colonization. A classic type: build a colonizing ship, send it to a system with planets that can be habited and establish an outpost. 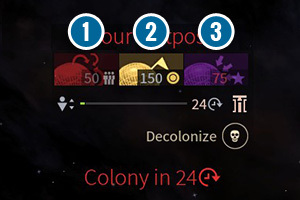 The time that is required for receiving a colony status depends on the amount of Food on a planet and the distance between the outpost and your other systems. You can speed up this process by spending Dust to increase Food production and/or you can spend Influence points to speed up migration process. Basic ships. Colonizer has 3 support module slots and one weapon slot. However, scout ships are different when compared to other races because they have two slots one for defense and support plus one slot that can be used for either of those types. This means that it can serve as your early military force or a well-equipped scout. Attack ships have a lot of weapon modules as well as a few slots that can be used by any of the tree types. 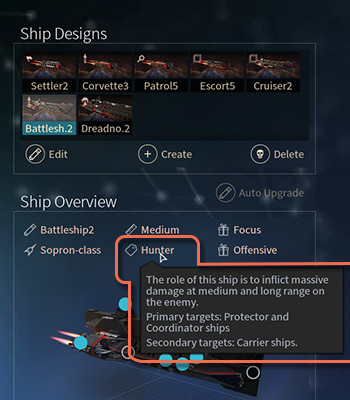 It is similar for defending ships – they have a small amount of weapon and support module slots but they have a lot of slots that can increase their armor and shields. Carrier can have up to 5 weapon modules (including one heavy and two shared with defense modules) and a few slots for additional support and defense modules. Humans’ fleet is versatile and flexibility but they always have more weapon slots when compared to other types of modules. Sophon is the race of curious but highly intelligent scientists. They value technological development, that is why their numerous bonuses are based on that field. However, they are weak warriors and you can see this many times, despite of having better equipment. Their ground armies and ships are a little bit weaker when compared to other civilizations. Nevertheless, this race plays nicely and you can easily obtain science victory. Special ability. They receive bonus that reduces science costs which is based on number of players that have already discovered a given technology. 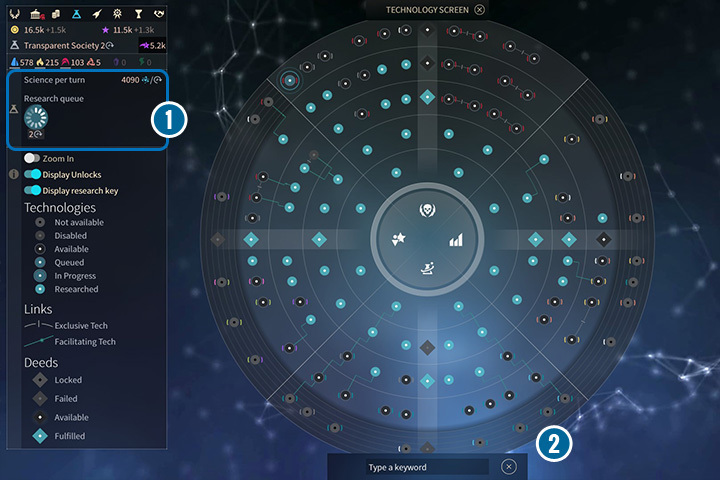 In the Technology Screen you can see which civilization developed a particular technology. Faction’s traits. They start a game with Pilgrims representative. Your faction can always see where and how far are the Star Lanes that connect neighbor systems. However, you don’t know names and number of planets of those systems. Their ships have two additional movement points but at the expense of Infantry units having 20% less health points. Race’s traits. Sophons receive +1 Science point per citizen and additional +3 points if they are on a planet covered in ice. They are mostly inclined to support Scientists, even if the events are pacifistic. They are not moved by Religious ideologies. During the second stage of Collection, which is to have 20 representatives, they receive +15 to Science in systems with their race. The last Collection bonus offers -20% of costs for all technologies. Basic ships. Sophons ships are noticeably weaker when it comes to some types. Colonizer has only three support module slots. Not only this ships is unarmed, it also has less slots than versions of other factions. Scout has only two weapon and support modules. Other types also seem a little bit weaker when compared to other factions. They usually have more defense or support module slots. Sophons fleet make up for it with their firepower granted by the law from Scientists ideology which increases damage from weapon modules by 50%. It is hard to call Horatio a race because they are clones of an unequalled genius that is both a ruler and a father of the entire faction. Their main traits are quickly growing population and very populated systems. But, at the same time, they want to have contact with other races so they can get their DNA samples which are later used to strengthen their members of society. Some technologies and special events can greatly enhance Food production. It is a great race for longer plays because the more genes they get the more powerful they become. They start with Ecologists ideology and their law allows to inhabit all planets except gas planets. Special ability. This faction’s aim is to get genes of other races. Thanks to them they can increase bonuses for their own race. In order to get a sample you need a few representatives of a given race. With each subsequent process you need more representatives of a given race. They also get bonus +5% to Food per race’s DNA sample collected. Horatio, after getting genes from a few races, become a very productive race. Faction’s traits. You start a game with a representative of Z’vali race. Your faction allows you to accommodate 1 more citizen on each planet. The number of dissatisfied inhabitants is smaller and heroes can heal two times faster. All of this at the expense of perfection which results in ships that cost 25% more Industry points. Race’s traits. +3 Food per citizen and +2 Approval on hot planets. They follow the Ecologists ideology. When they reach 20 representatives in your empire you receive +15% to Food in a system with Horatio. The last bonus is an additional 0.1 Influence points per one unit of Food. Many upgrades for this race revolves around Food which means that this bonus is very strong and useful. Basic ships. Their Colonizer ships have only 3 support module slots. The exploration class has the usual equipment – 1 weapon module and a few additional ones. Attack classes has less modules than the equivalent ones from other civilizations. However, most of their slots has mixed restrictions which means that you can adjust your fleet to your preferences. For example, a small attack ship has two weapon slots (in one of them you can place a defense module instead of weapon) and the remaining two slots allows you to install a support or defense module. A similar situation is with a small Protector – it has one slot without restrictions and three support module slots where two of them can be interchanged with defense modules. Thanks to that Horatio fleets are very flexible and you can create almost any combination of modules although in a smaller quantity. This race preys on others. Their advantage and disadvantage is to exploit a planet to the limit with a help of other races. This slavery is not received well which affects the general happiness. However, their fleets are numerous and can be a real threat, especially in the first few hours of a match. They have special abilities connected with slavery, e.g. they can start a special project which increases Approval for a few turns at a cost of a representative of another race. After exploiting a planet in a system you should leave that system and search for richer resource deposits or inhabit a system without Cravers being part of a new population. Cravers can accelerate the production significantly in systems with other races but at the expense of planet’s resources. Special ability. Enslaved populations receive +100% to FIDSI productivity but the Cravers loses 10 points to Approval. Faction’s traits. In their main system you can find a representative of Haroshem. Their fleets are 25% less expensive and can hold two more Command Points than the rest of the factions. Planets that are under their rule can hold two more population units and their ground armies have +10% health points. Their lifestyle doesn’t allow to have peaceful relationships if the Militarists are the leading party. If any of the other ideologies is the ruling one you can have various political and trade relationships. However, when Militarists are back as the leaders you enter a Cold War with them. Race’s traits. +2 depletion points per citizen on a planet and +150% to production on non-exploited planet. Depletion points add up and you can see them in the Star System Management screen displayed over each planet. When this value reaches its maximum then you will receive much less profits from that planet. Cravers’ favorite ideology is the Militaristic one and even events that have influence on pacifists will still boost the support of the Militarists. Basic ships. Their ships are usually the regular types although Colonizers don’t have any weapons and scouts have a small amount of them. Most of the ships have similar parameters and number of modules when compared to other factions, e.g. Humans or Sophons. Cravers’ fleet overcompensate all of this with their numbers. A race of space merchants where everything revolves around profits and money. They have a big bonus to Approval which may be because wealth makes them happy. Dust is the most important element for this race. They use Dust instead of Influence points when they are negotiating with minor factions. They don’t need colonizing ships. Instead of that they buy planets and place their outposts immediately. Thanks to that you can buy planets that are close to other factions and then sell them. Most system upgrades, that are based on getting Dust, are better and give more profits than normal upgrades of other races. The possibility of quick expansion and big profits makes this race perfect for achieving economic victory. Special ability. They use Dust to buy outposts instead of using colonizing units. Lumeris can also sell or negotiate outposts with other empires. Faction’s traits. Their trade routes are not interrupted in systems of those empires with which you are at Cold War. Lumeris are a very happy race – they receive +20 to Approval in all systems. Their scout ships has an increased amount of probes by 1. Race’s traits. They have +1 to Dust per citizen and additional +3 if a planet is fruitful. Their most favorite ideology is the Pacifists one and events that regarding ecology also have an influence on that value system. Their least favorite ideology is the Militaristic one. By having 20 members of this race each system, even with only one representative, receives +15% bonus to Dust production. Way of colonization. Almost a classic type: you can’t build colonizing ships. Instead of that you simply buy outposts in the system that you want. Next, you take care of it like most of other races. The time that is required for receiving a colony status depends on the amount of Food on a planet and the distance between the outpost and your other systems. You can speed up this process by spending Dust to increase Food production and/or you can spend Influence points to speed up migration process. Basic ships. No ships from colonizing class. Instead, you begin a game with two scout ships. Those units have 4 modules where 2 are for weapons. Most of the ships from higher levels does not stand out when compared to other races. Usually they are very balanced when it comes to module types but they don’t have many slots where you can install different modules. It is an unusual race because they came to the Endless’ universe from other dimension. They took the form of robots with unique abilities. Because they are from other dimension and see things rather differently the reproduction is no exception to that. They don’t use and don’t need Food because new population units are produced in the same way as ships and upgrades. Each subsequent member of a system costs more than the previous one. However, the costs are separate for each system. They like to colonize and their favorite systems that are least friendly to most of the citizens of the galaxy, those planets are: lava, sterile, barren and arctic. Their technologies unlock the ability to colonize those more friendly to other races. They can also learn about terraforming planets, however, this process is different than in other civilizations. Special ability. Their special ability is to create Singularities. They are special projects that can be stored for later. Their current number can be seen in something similar to equipment in the upper left corner below the bar that shows your Dust income, current inventions etc. 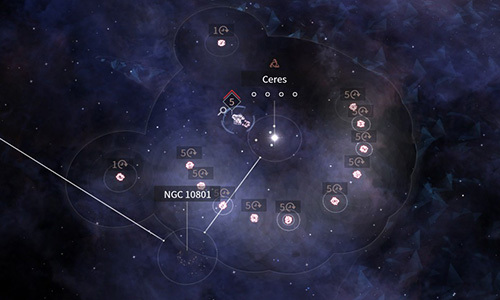 You can use a Singularity on any system under your control at any moment but also the same can be done with systems that are in view range of your units. Some strengthen system, speed up production, open portals or weaken all activities within a system. Faction’s traits. Wary travelers reduce their movement by 1 point. They have Approval reduced by -10 points on fertile planets but this factor is increased by 20 points on sterile planets. They begin a game with Titanium and Hyperium deposits on their starting planet. Race’s traits. Population units must be constructed. There is a special project in the System Development that is used for that purpose. They have +5 to Dust, Industry and Science per citizen. Each Collection status gives you the access to: more support to Industrialists, +15% to Industry on planets with Riftborn and less movement points when a fleet uses a special tunnel and additional movement point per ship. They favorite ideology is the Industrialists one even if there are events connected to science. Ecologists’ ideology has no impact on them. Way of colonization. Build a colonizing ship, send it to a system with inhabitable planet. After establishing an outpost you must build a new citizen. If a planet has high Industry then the process is faster. You can use two actions that can help this process but you must use strategic resources. Costs increase with each new subsequent outpost. No civilian ships are send to an outpost. Basic ships. Their Colonizer is unarmed, it can only use support modules. Because of that you can install more engines and increase its speed or use it as an early invasion ship. Scout ships have two weapon slots and 3 support slots. Attack ships have a lot of weapon module slots which makes them dangerous enemies. Defense ships (Protector and Coordinator) can be classified as average when compared to other civilizations. This race’s Carrier class is rather good. It has slots for three modules, one heavy and a few slots for defense and support modules. Riftborn’s fleet can deal a lot of damage even if you are falling behind in when it comes to technology. 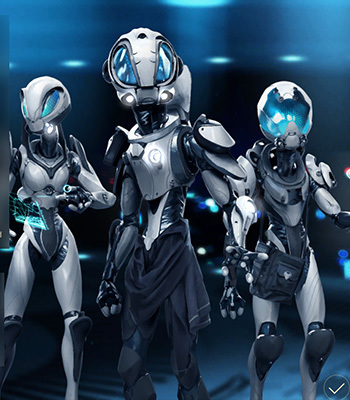 They are a zealous race of aliens that relies on the Endless technology to survive. Their suits are powered by a unique resource, which you’ll need to acquire in an equally unique way. They live in gigantic mother ships, traveling between star systems in search of rich worlds. The thing is, they do not have to colonize any planet – they just need the right technology and an anchored Ark. 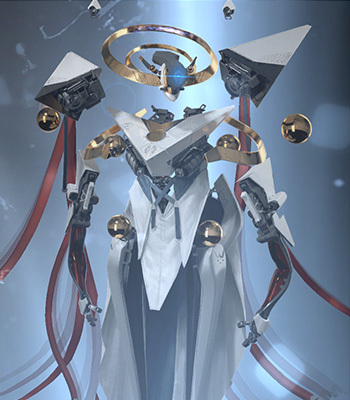 The Vodyani are a very religious race, and they have made it their policy not to welcome any other alien races into their ranks. They can however, form alliances with major and minor factions, all for the good of the Vodyani church. It’s not the best faction for beginners. Their population, living exclusively on ships, increases very slowly, and the entire Ark system may seem a bit complicated to first-timers. I’d recommend the Vodyani to people who like challenges and prefer galactic conquest. The Essence is the special resource of the Vodyani; it can be harvested from other inhabitants (1). In the right upper corner, you’ll find the number of Arks available in your empire (2). Remember that every Ark resident works on all available planets (3). Special ability. The Essence is the basic resource needed to build new Arks and increase the Vodyani population. It is represented by an orange symbol of an Egyptian cross. There are several passive technologies that will enable you to gather this resource, e.g. some support modules. The main method is to send ships with those modules installed into inhabited star systems. Your races will always live in Arks. 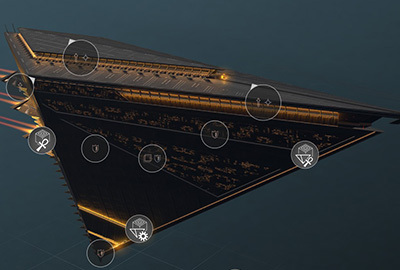 The ships may be equipped with modules that steal Food from inhabited planets and increase the amount of harvested Essence (1). You can also contact a minor faction and, if your relations’ bar is full, conduct Brain Washing, which will result in a permanent alliance. You will receive less Dust and loose some Science bonuses, but you will be given increased human resources and a small amount of bonus Essence. By using the luxury resources you may exchange a unit of population for more Essence from a given system. The Essence cap increases with every Ark you buy. At the same time, it equals the cost of a new Ark. Arks are the powerful vessels inhabited by the representatives of your faction. They may be bought for Essence in any star system under your control, and it takes only a single turn to produce one. Each subsequent Ark costs more than the last one. The Arks can work in two modes – anchored or as a fleet. In the second mode, they move like any other ship; in the first one, they can capture star systems and colonizable planets. They do not have to colonize planets one by one. One Ark resident works simultaneously on all colonized planets. No matter if there’s 1, 2, or 5 of them in the system. Assuming you have the technology that enables you to inhabit those planets, a single Vodyani will grant you profits from all planets in the system. In the beginning, a single Ark can accommodate only 3 residents. All upgrades bought throughout the entire system are installed within the Ark. If you decide to move, you will retain the entire set of upgrades as you reach the next system. The overcolonization penalty depends on the number of controlled systems, not your Arks. An Ark has a large number of HP and 3 weapon slots, including two for heavy weapons. Additionally, it has several slots for defensive and support modules, making an Ark a fortress, if you wish it to be so. Arks are your only means of controlling star systems. Faction traits. 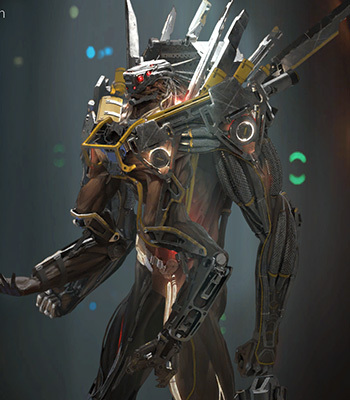 Vodyani are interstellar travelers, having an additional +1 to ship movement. Their infantry has 20% more hit points. Their heroes receive 2 additional points per turn, and require 50% less Dust per turn. Race traits. They receive a +4 bonus to Dust, Science, Food, and Production per a resident and per each planet. That’s why you should search for systems will the largest amount of planets. As a downside, your population grows 50% slower. The Vodyani are influenced mainly by their Religion, Militarists may have some influence on the former. If you manage to gather 20 representatives, you’ll receive a 5% bonus to a wide array of FIDSI resources in systems with Vodyani presence. Colonization method. Only through an anchored Ark. If you have the necessary technology, colonization affects all planets in the system. Basic ships. Their basic colonization unit is a special ship, whose main purpose is the acquisition of Essence. It offers four support module slots, including one shared with armament and another one shared with defenses. A scout has two weapons/support modules. Medium ships offer a good balance between various modules, and the largest vessels offered by the faction are equipped with 4 dedicated weapon slots (including one for heavy weapons) and several other specialized or mixed. 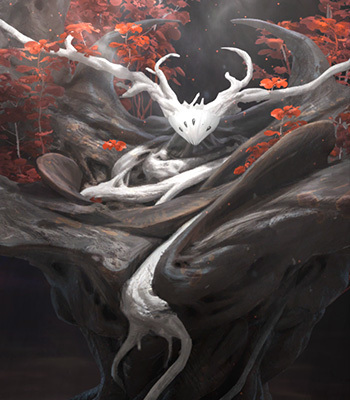 The Unfallen are a tree-like species, deeply rooted (pardon the pun) in its home planet. They rely on special links (vines) between star systems to increase their territory or aid friendly and/or allied civilizations. Colonization can be accomplished only through such special links. They do not extend an influence zone around their star systems like other races do. The Unfallen depend mostly on quick population growth, which is clear once you see their traits. Another unique thing about them is the minor race of Guardians. You can find their representatives by examining Curiosities in uncharted systems. They are capable of quickly terraforming even the most hostile planetary environments, cold or hot, once you complete the quests related to their species. Special ability. Instead of typical colonization ships, you are given special vessels that can be sent from systems already controlled by the vines. Once in a new system, the process of linking is initialized. If it gets interrupted, either by your choice or, for example, by the destruction of your ship by the enemy, the process will have to be repeated from scratch. You can also link up nebulas or asteroid belts, adding their bonuses to the bonuses of the mother system. To assimilate a minor faction, you’ll also need a vine link in addition to a full relations’ bar. Faction traits. They have the ability to discover the locations of Guardians, a minor race, very important to The Unfallen. You need to colonize the planet on which you’ve found the Guardians to be actually able to use them. They inflict a bonus of damage in battles, planetside and in space, for each friendly faction and empire. Additionally, they provide a +8 bonus to Approval during peacetime, and +16 for each alliance with another empire. Race traits. The Unfallen receive a +5 bonus to Food, and further +5, for a total of +10 on fertile planets. If you assemble 20 representatives, you’ll receive a 15% bonus to Influence points. They are Pacifists by nature, being quite against Industrialism. You’ll often encounter Guardians, a minor race providing a +5 bonus to Approval and inflicting bonus damage when defending against an invasion. The required number of representatives for collection status is smaller for this race, being 5, 10, and 20 citizens. At 10, they receive a +10 bonus to Approval, and at 20, they unlock a special act. The Guardians cannot be moved between systems and planets. They are assigned to the place in which they were discovered. Colonization method. If the system is under the control of your vines and there are planets, which can be colonized, colonization will be instantaneous. Basi ships. All ships of this faction have good armor. Almost all ship classes have at least 2 defensive module slots. Medium ships are characterized by a single omni slot, on which you can install any module. The downside is reduced number of weapon slots. Even their biggest ships have only 3 weapon slots (including one for heavy weapons), where other factions’ ships usually have 4. The Unfallen fleet’s basic tactic is to endure rather than knock out the enemy. Each ship is worth a certain amount of Command Points and a fleet can only hold a limited number of Command Points. All ships that you build are placed in hangars and you can store a lot of them. However, they don’t participate in battles. Fleets are the core of your forces in the game. They take over new systems, discover galaxies, examine Curiosities, fight with enemies. Each ship has a certain amount of Command Points. The bigger the ship, the more Command Points it requires. Each fleet in your empire can consist of a certain amount of ships which is based on the total amount of Command Points. Almost every faction starts the game with 4 Command Points per fleet. This number can be increased by developing new technologies. It is very important because the biggest ships require 6 Command Points. The more ships you have in a fleet, the more firepower you have. Only one fleet can participate in a battle. If you have 20 ships in total but they are divided into fleets with 4 ships per fleet and your enemy has only one fleet with 10 ships (or the total amount of Command Points is 10) then the enemy’s chances are greater and they can destroy your fleets without any loses. Remember that your fleets heal and resupply their crews faster when they are in your systems. Hangars are places that store your ships on planets. They can keep an unlimited amount of ships, however those vessels don’t participate in battles and can’t support defense systems. On the other hand, when enemy’s fleet is bigger it is wise to wait with producing additional ships and send one of your stronger fleets. If your fleet is orbiting your system you can move your units on a planet. In the game you can find a rather simple ship editor. Each unit has different amount of life, movement speed and the most important: number and types of modules. Some of the bigger units can have less modules but they can give you more profits. Say, if you place a module it is counted as if you have placed 2 or 4 modules in that slot (depending on slots in a given type of a ship). Modules. Each ship has a limited amount of slots for particular modules. Some factions can have less or more module slots, even in the same types of ships. Besides the cost of building a ship you must also add the cost of creating each module. Sometimes it is better to leave some slots empty so you can deploy a given ship sooner. Better modules require more Industry points and better versions require more strategic resources. Those modules have the same color as a required strategic resource so you can easily check what you need to do. Weapon modules. You have four types of weapons – two based on kinetic projectiles and two based on lasers. Pay attention to damage, additional properties and their effectiveness at certain ranges. Defense modules. Here, you can only find options to upgrade armor and shields. You should adjust your defense to weapons of your nearest neighbor or your greatest enemy. Besides that it is recommended to have a balanced number of those modules. Support modules. In this category you can find all parts that improve your ships. From additional engines, repair modules to shield generators and siege equipment. Some ships have limitations when it comes to modules which means that you can install only weapons or defense modules. You can see it when you look at module’s symbol. Some places have mixed restrictions while others have none. Other modules can be installed only in specific types of ships, e.g. probes can only be installed in scout ships. Hero ships can also be upgraded but you must pay Dust and strategic resources. You can do this by entering the screen where you can view a particular hero. Not only you can upgrade your old modules but you can also install new ones in empty slots. It is worth to upgrade ships of those heroes that command fleets or if you want to send them as scouts. Some ships have assigned roles that have impact on how they behave during a battle. Each ship has an assigned role that makes them attack particular ships in a certain order. Additionally, ships can be broken down by their size: small, medium and big. Bigger ships have more health points, they also need strategic resources to build them, even without special modules. Size indicates the number of modules and their multiplier. Module slots in medium ships are counted twofold and in the big ships some slots are counted fourfold. For example: a laser turret that deals 5 damage in a small ship’s module can deal 10 damage in a medium and 20 in a big ship. Because of that, despite of having less module slots, the firepower is bigger. A similar situation is with defense modules and some support ones. The same goes for production costs and required strategic resources. Colonizer. Its task is to use a special colonizing module. Besides that it has a lot of support module slots and can be used, e.g. as an invasion ship. Explorer. Usually doesn’t have a lot of space for weapons but it has a lot more speed and is the only ship that can use probe module. It is worth to have it in some of your fleets to clear routes and systems in front of you so you can avoid any dangers. Attack and Hunter. Those ships are made to deal massive damage. First, they attack defense ships (Protector and Coordinator) and then they attack the bigger ones, Carriers. Those ships have additional modules that lower their threat level in enemy’s eyes and have a lot of weapon module slots. They receive a small bonus to damage because of their role. Protector and Coordinator. Their role is to get enemy’s attention so enemy ships concentrate their fire on them. Those ships attack their equivalents as their primary targets. They usually have a lot of defense and support module slots. In addition to that they also have a small bonus to shields and armor. Carrier. Huge ships that have a lot of module slots including slots that allow you to install more devices (x4 modules) and, at least, one heavy slot (x8 modules). First, they attack other Carriers, then Attack ships and Hunters. They require 6 Command Points in a fleet. A very deadly ship that can be used for many goals. Some of the types can be upgraded to have a few additional module slots. Developing technologies allows you to increase the number of new weapon, defense or support modules although you have to spend more Industry points and strategic resources. It is an expensive process but you don’t have to use all unlocked slots. It is wise to use this option if you have a lot of resources or you want a specialized ship, e.g. for sieges, with modules that increase speed or can repair the entire fleet. Arks. Vodyani’s special unit that serves as a mobile city. The process of constructing them is a little bit more demanding. They use a special currency called Essence to produce those units. However, what is important to you is that they use 8 Command Points, have a lot of health points and module slots. You can also find a few special modules that can only be installed in this ship. Hero ships. Their looks and number of modules depends on hero’s class. Some have more slots for support modules, other have almost only weapon modules while some of them offers you a smaller, although more universal, space for modules. If a hero is assigned to a fleet then their ship travels with the entire group but it doesn’t use Command Points. This means that you can use their unit even if your fleet is full or you can create a fleet that consists of only heroes and their flagships. Remember that if you disband a fleet with a hero then said hero is treated as expelled which means that you must wait a certain amount of turns before you can assign them again. Although battles are your bread and butter they are not as exciting as you might want them to be. You can see how a battle goes but you don’t have much influence on its result. Space battles are rather simplistic. First, you must force your enemy to stop in a system by using the blockade order (the one with the symbol of a shield). If enemy’s fleet is still in a system select attack icon (crossed swords). You can now see an initial battle screen. Here you can make some preparations. 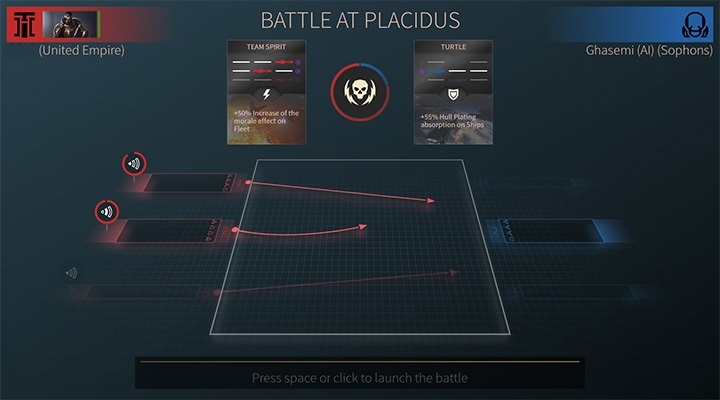 After selecting a tactic and placing your units you can proceed with battle. You don’t have any direct control over your fleet during a battle but you can do a few things that will grant you victory. Before a battle you can choose which ships belong to one of the three striking teams: flanks and center. Place your ships while keeping in mind your tactic, range and weaponry of your fleet. Choose the right tactic. You can choose from a few tactic cards. They are special behaviors for your ships during a battle. The cards inform you about two things. First, you can see a default placement of your fleet. Second, you can check bonuses for your entire fleet, e.g. better defense against projectiles or stronger shields. If you have a lot of ships that are equipped with weapons that are good at close distance you can select a suitable tactic that allows you to get closer. Your fleet is armed mostly with missiles? Select a tactic in which your ships will stay away from your enemy. Appointing an admiral as a commander of a fleet can also help you to win. However, you must assign him to a group before a battle takes place. His ship is not counted in the Command Points of a fleet and, usually, he is very useful especially in the beginning of the game. It is best when a hero has at least one or more abilities that can help your fleet. Assigning a hero with an ability that increases attack of laser weapons means nothing if your ships use kinetic weapons. The easiest solution for winning a battle is to: have a few fleets (they can finish of a wounded enemy), have a more numerous fleet (more means better – your armies receive a small attack bonus; however, you need more Command Points), bigger ships in your fleets (a medium ship requires 3 Command Points which can be converted into 3 small ships; its firepower is simply higher than that of a group of small ships) and installing better weapon and defense modules in your ships. Ground armies are used only for defense during an invasion or when you want to conquer an enemy system. You don’t have to train them separately like ships. Ground armies are based on the amount of fleet crews and defense forces in systems. The second value can be increased by building certain military structures or by assigning a hero that can increase it. When it comes to ships it all depends on the size and number of special support modules that increase the amount of people in a given ship. Bigger ships have more bonuses for those modules so you can think about making a specific type of a ship with a lot of support modules and with a small amount of weapons. This “invasion” ship will only be used for assaults and conquering planets. A ground battle happens when a fleet is orbiting a system in which there are no enemy fleets that can interrupt an invasion. First, if you want to initiate a ground attack you must start with a system blockade. If forces on a planet are stronger than yours you can wait with an attack. Because of a siege, a defender’s garrison gets smaller with each turn. Some modules can speed up this process. However, it is usually better to start a ground battle because you can avoid a counterattack by enemy’s fleet or a situation in which you were close to take over a planet but you were forced to sign a peace treaty. 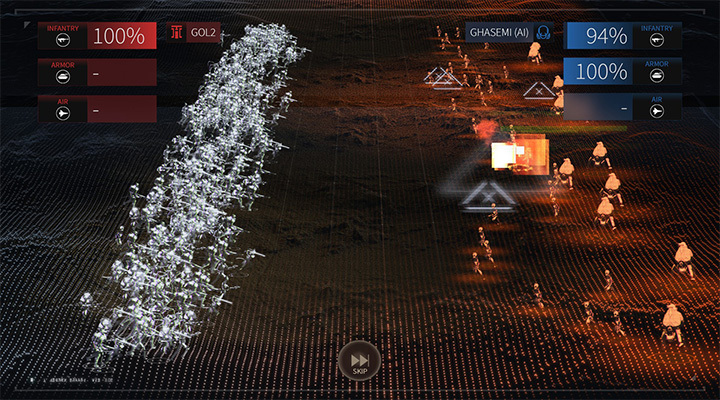 A ground battle is similar to those that take place in space. After selecting a tactical plan you can see how your forces are doing on a planet. Before that you can add heavy equipment or upgrade your units in Military screen. Some race bonuses can help only when you are attacking or defending a system. Usually, it is an additional attack before a main battle or an increased number of soldiers in a system. As you can see your options, when it comes to helping and supporting your army, are very limited. Preemptive Bombing. You damage enemy’s army before an attack but you increase your chances in damaging improvements and/or killing population. Infiltration. A round is longer but the attacker has bonuses to resistance at the expense of attack power. Blitz. A quick attack that deals a lot of damage but is also deadly for the attacker. Local Resistance. You receive additional units but you must spend one representative of a race. A useful option if you don’t have a lot of units in garrison or your reinforcements will take some time to arrive in your system. Protect System. A head-on battle. Defender’s army has more health points but the loses in civilians and buildings are smaller. Surrender. You give up a system without a fight. This option is useful if you want to avoid destruction in a system and you have already sent a fleet to help the defenders. Your choice of ground army is unlocked with your technology progress which allows you to change your units. You don’t have to train or buy new units. You just have to enter the Troop Management menu. Here, you can increase the usefulness of various types of units by paying a certain amount of money. An upgrade is immediate. You can also increase the number of a given type of unit in your army. The army created in this screen will appear in every ground battle, invasion or defense. Infantry is the basic type of units, you can enhance them by using better anti-aircraft attacks. Armour focuses on receiving damage and crushing infantry but it has problems with fighting aircrafts. Air is the best and the most expensive, when it comes to upgrades, type of units that you can have. Deals a lot of damage and has a decent amount of health points. Its goal is to destroy Armour units. If you plan on having many ground battles you should remember to have a suitable amount of crew in your fleets so your ground armies will have more units. You can build a few ships that have support modules that increases the number of crew. If your enemy uses only Infantry then you must develop Armour units as quickly as possible. If they also use these units then get Air units and upgrade your Infantry. But remember that in this game wars are won not on planets’ surfaces, but in space.